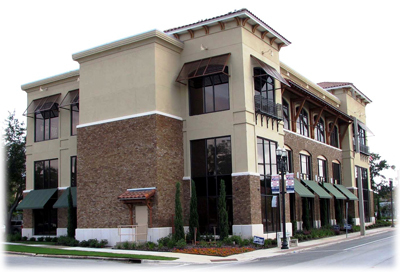 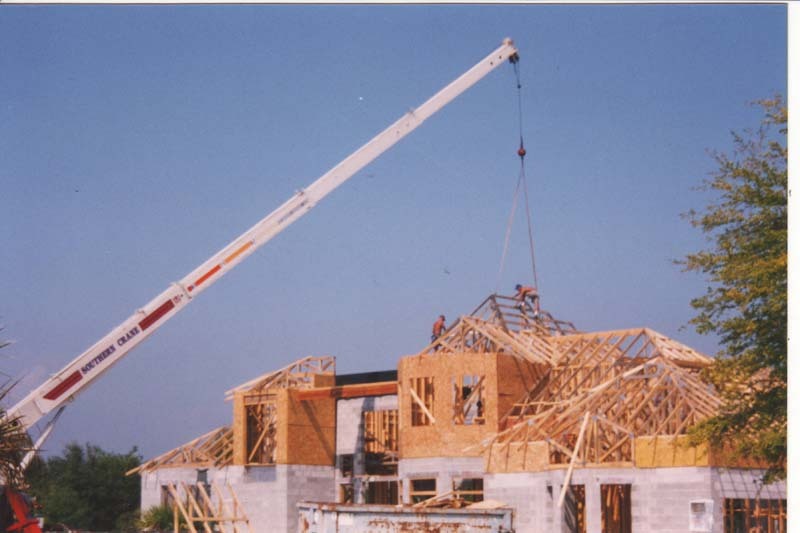 Raymond Joseph, who has a Bachelors Degree in Building Construction, created Joseph Builders in 1999 with the goal of promoting to the customers a truly “custom” building experience. 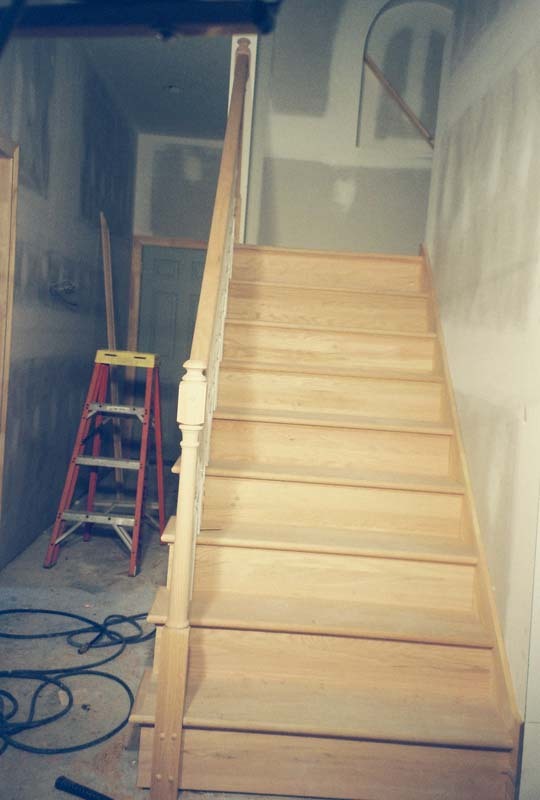 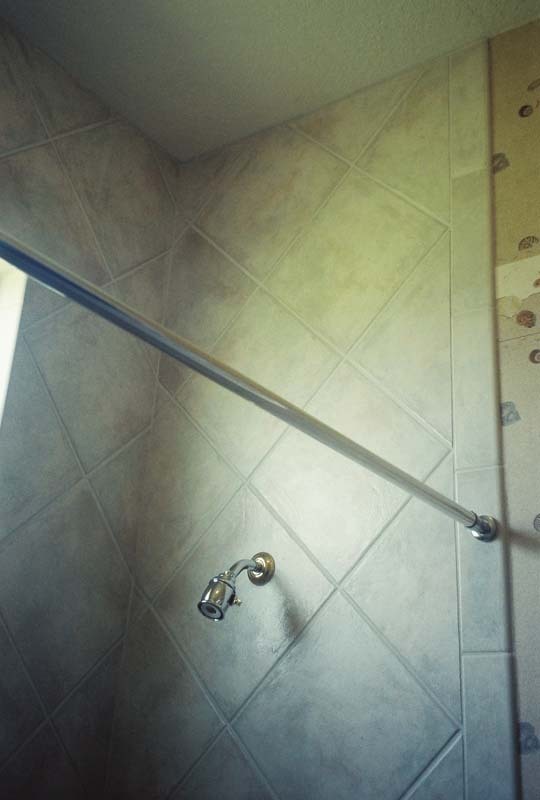 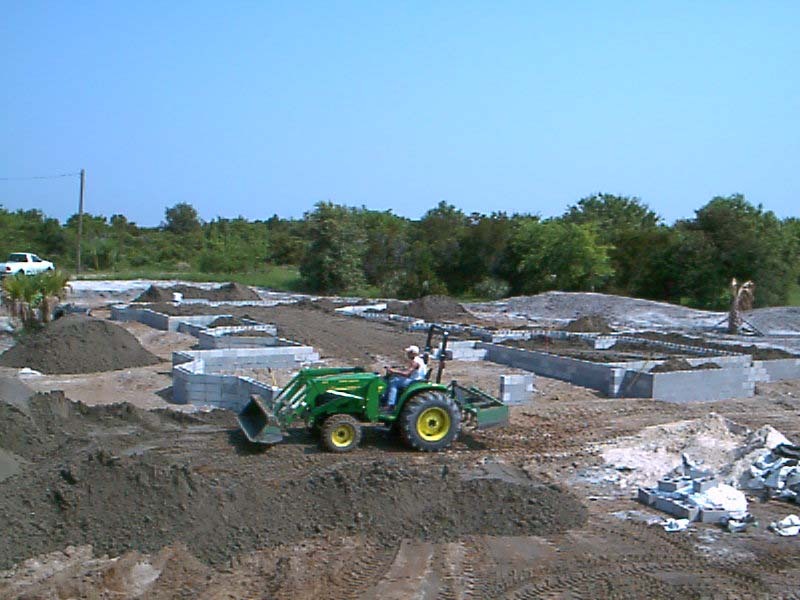 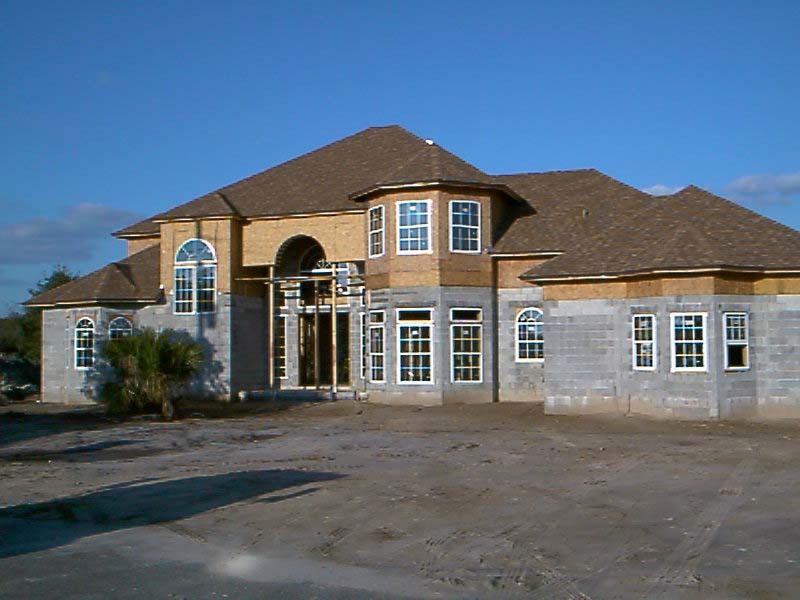 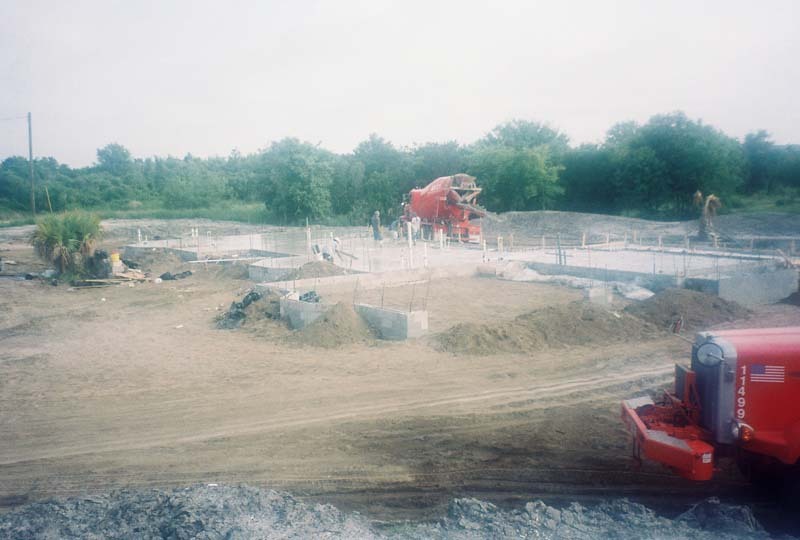 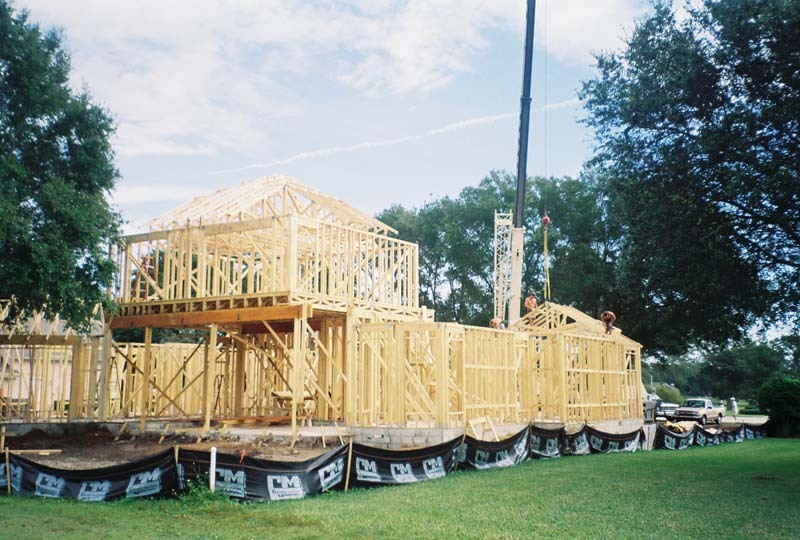 Joseph Builders maintains a low volume of homes and or buildings under construction; so that Raymond is able to lend his expertise throughout each phase of the building process. 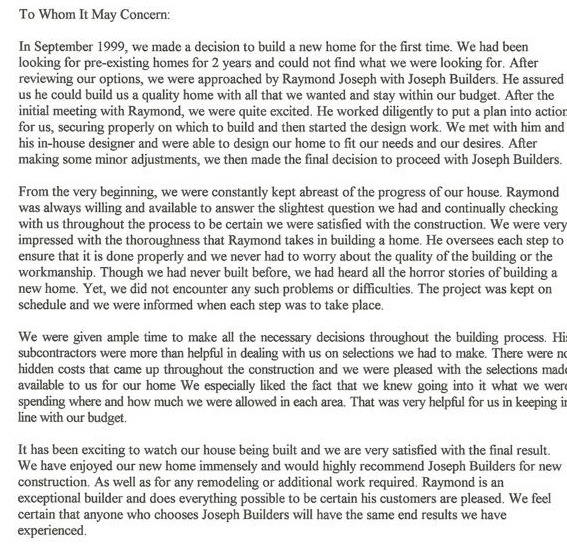 Raymond Joseph oversees all aspects of the homebuilding experience. 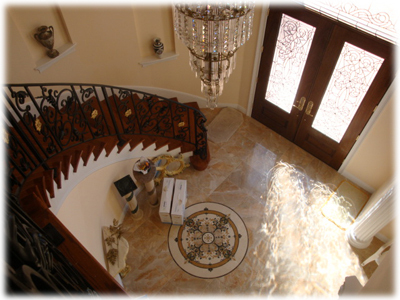 By doing this he can maintain customer satisfaction as his highest priority. 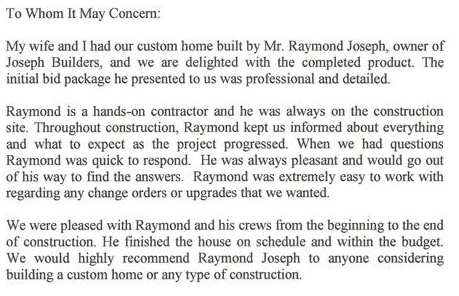 Through his direct involvement, Raymond builds a unique one-on-one relationship with each of his customers based on confidence, trust, and the secure feeling that they have their own “personal” builder working for them. 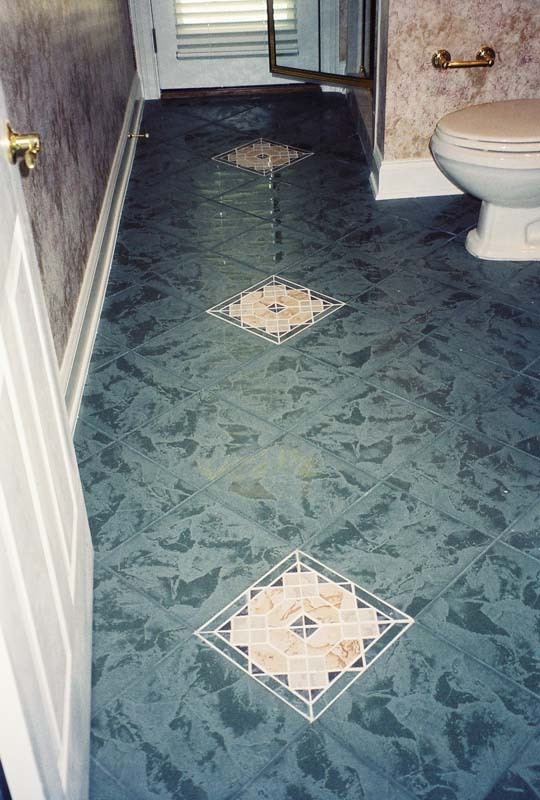 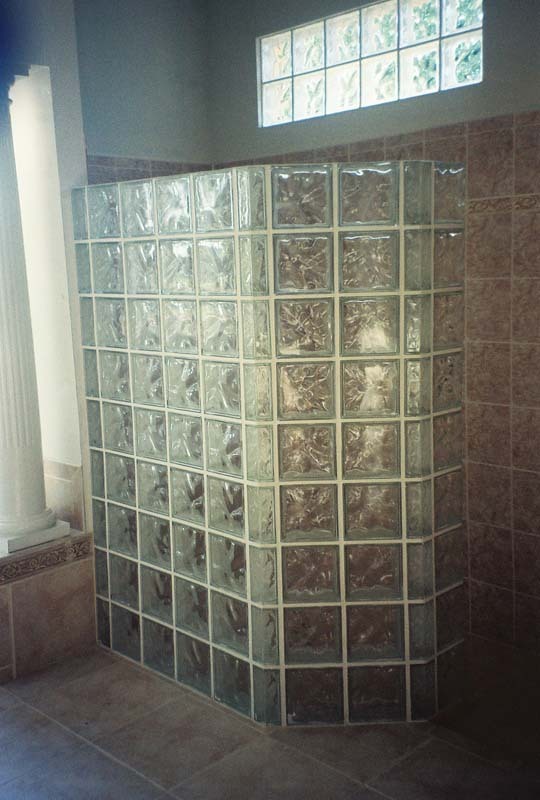 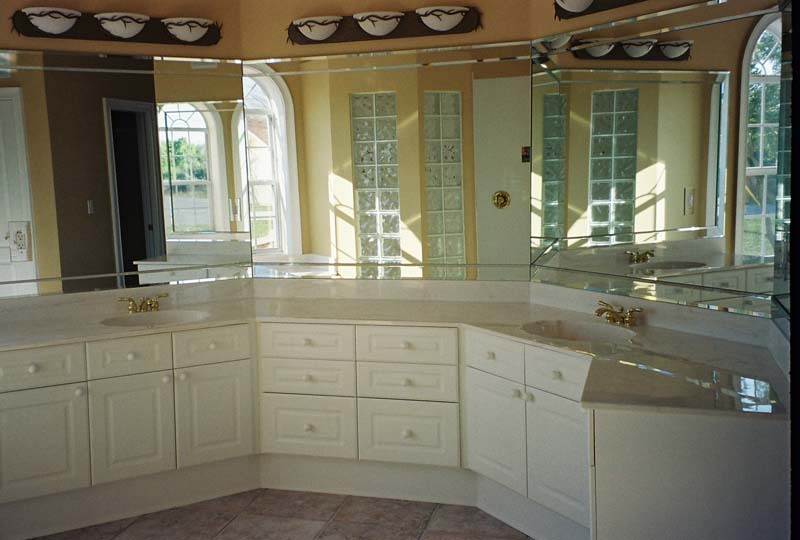 We are not salesmen and do not push specific brands or products upon our customers; instead, we offer our experienced and professional advice on the feasibility of your desired project. 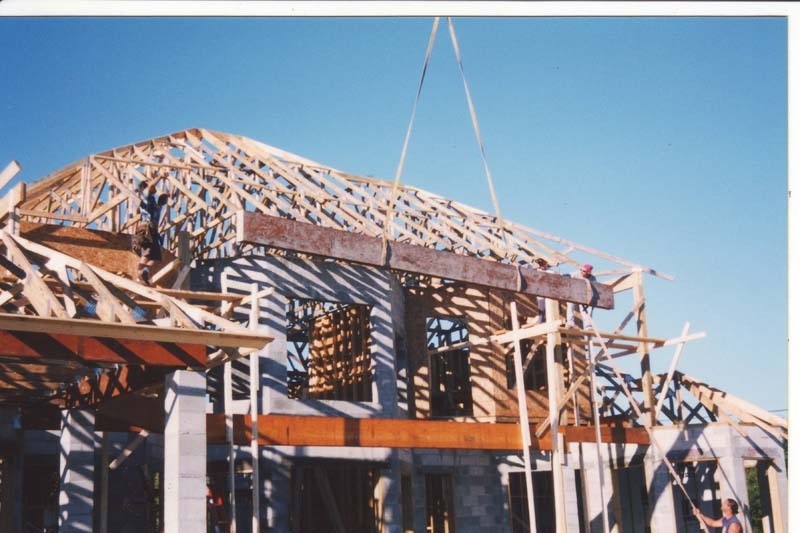 From concept to completion, we will provide you with direct communication, ensuring that you are an integral part of your projects progress. 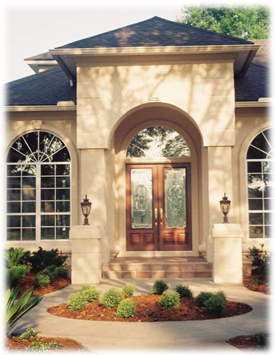 The first step begins with an in-depth meeting with you; the homeowner, to fully understand your specific needs and desires. 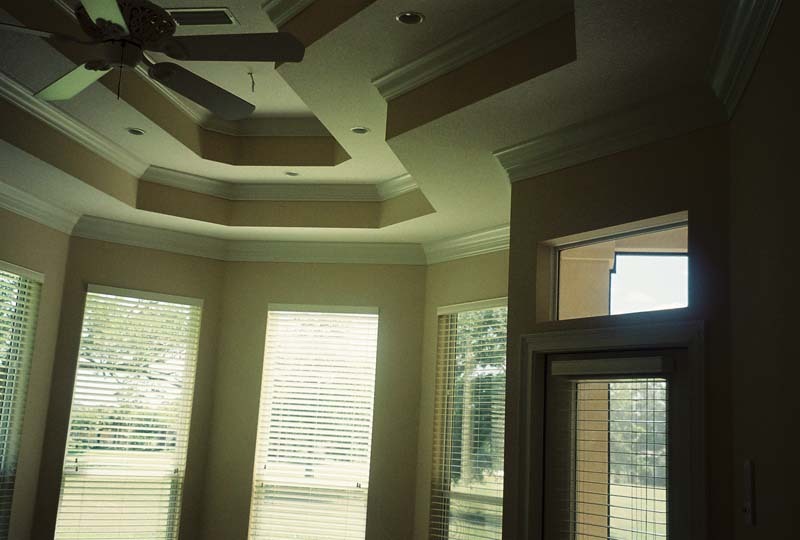 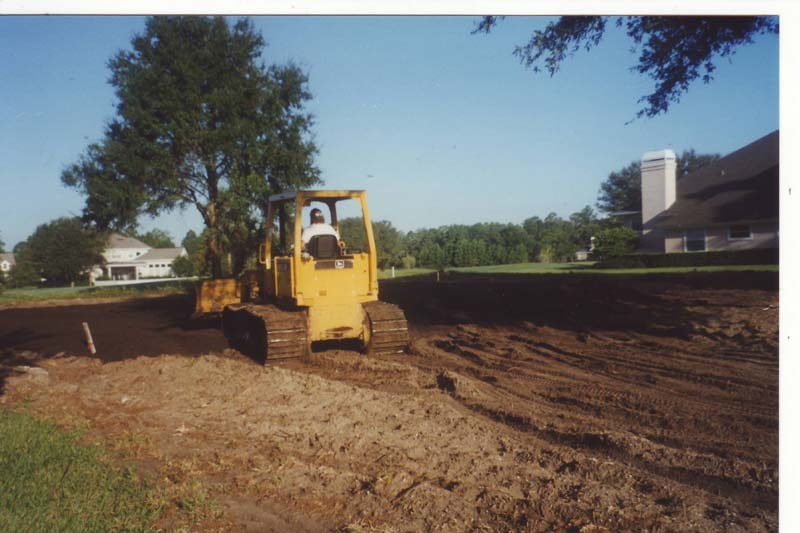 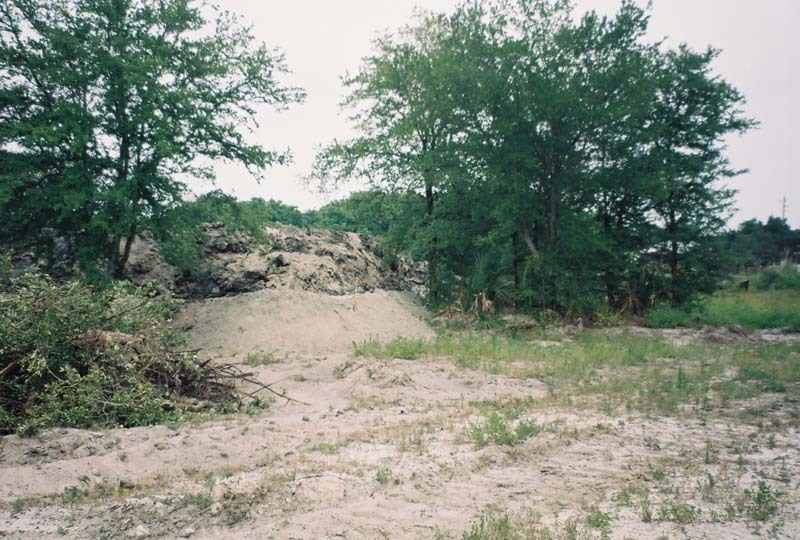 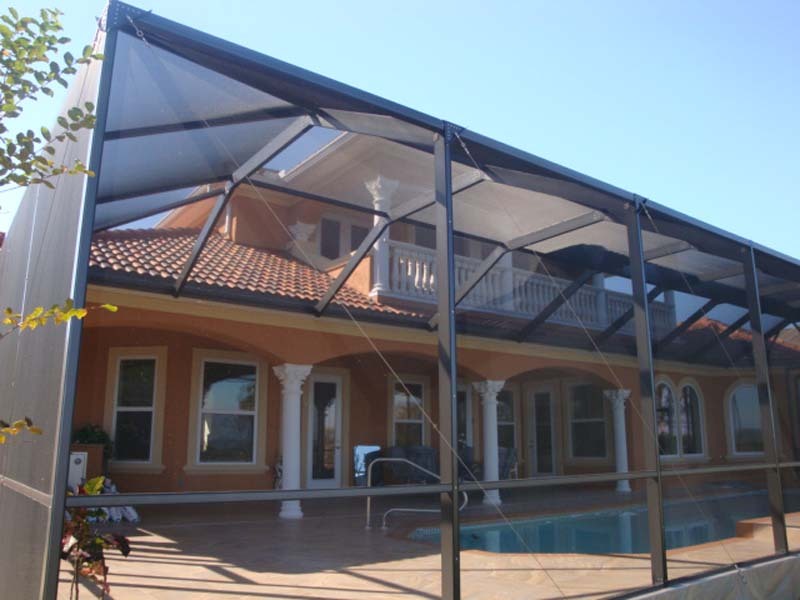 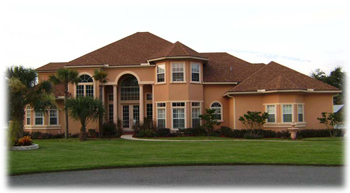 We will then take this information and implement it into the design phase or go over your custom designed set of plans. 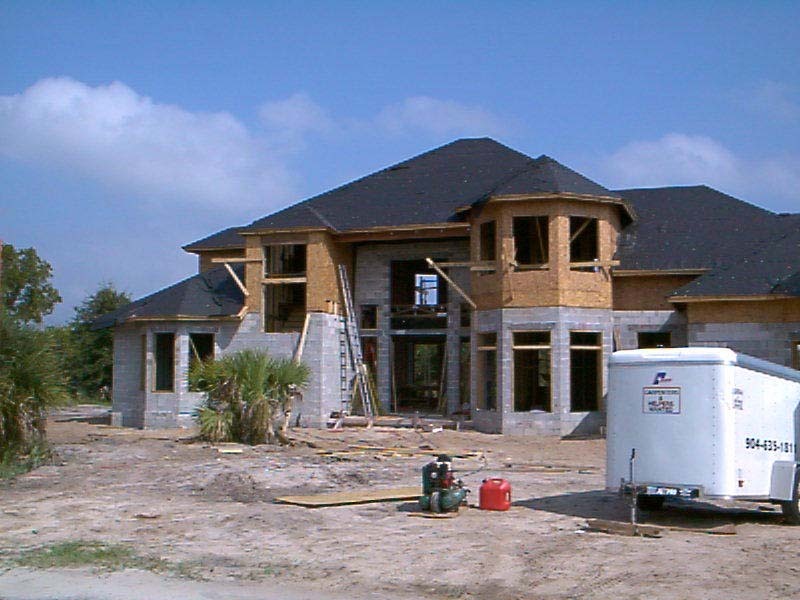 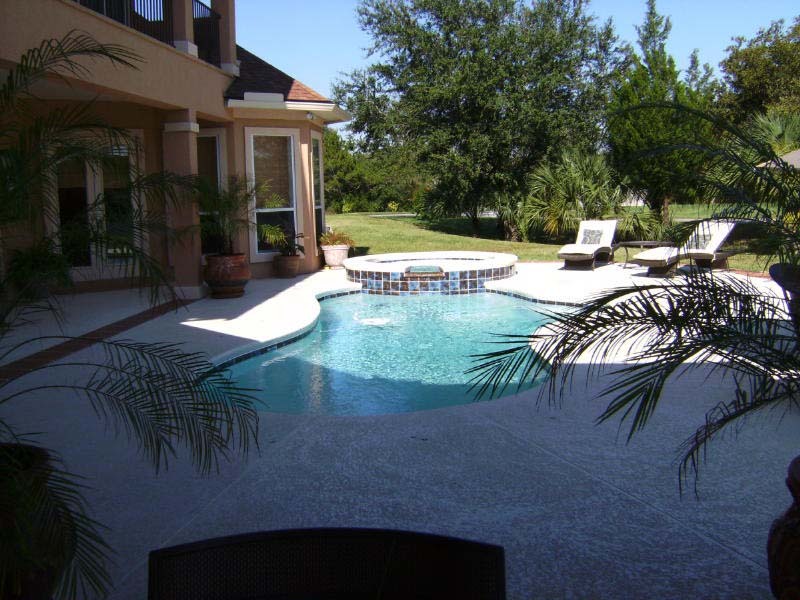 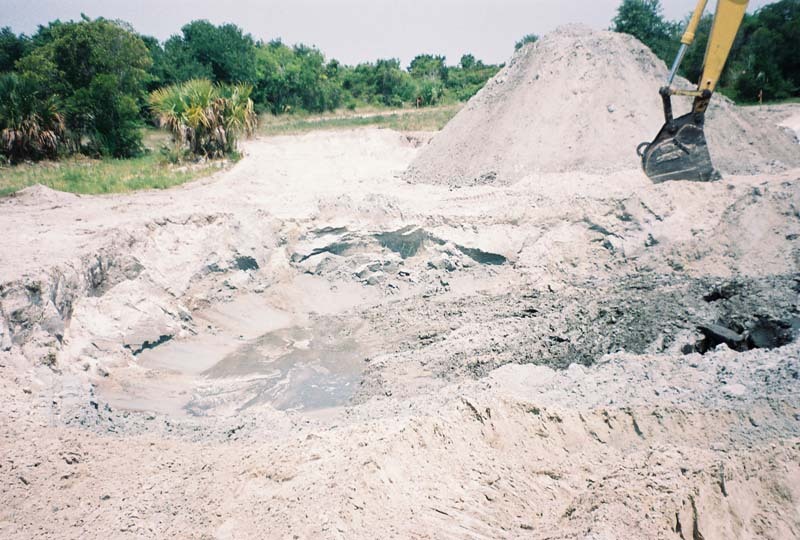 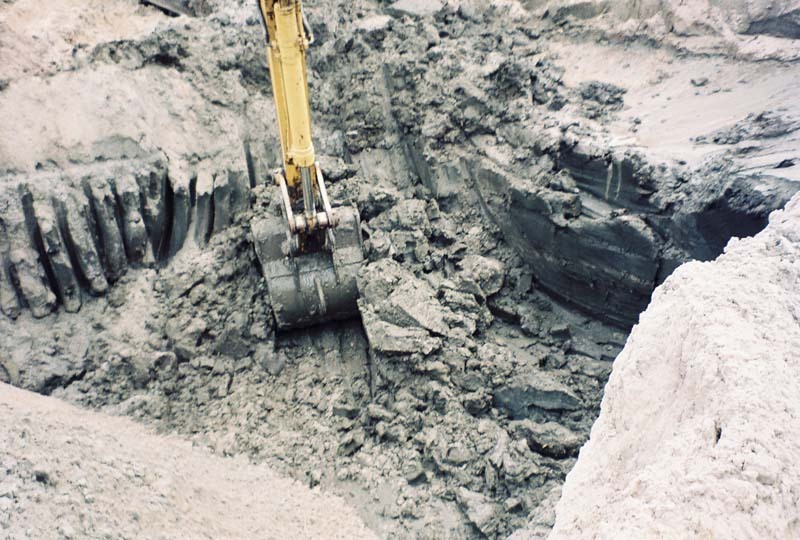 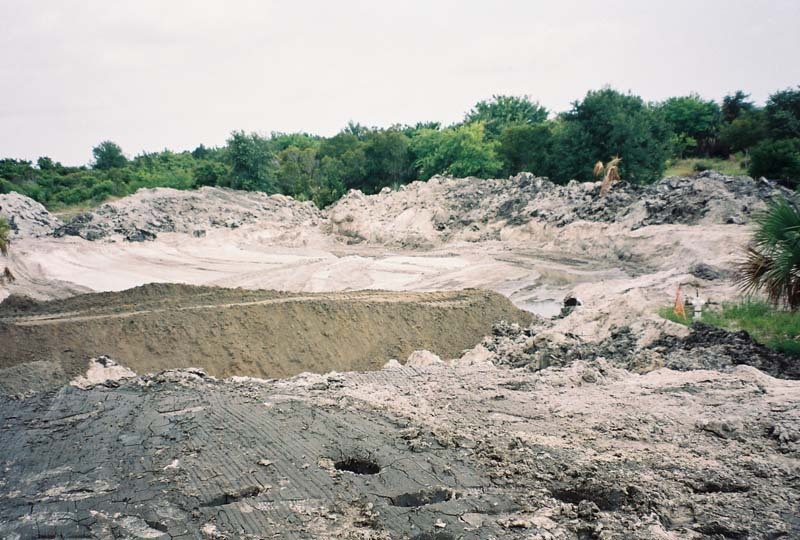 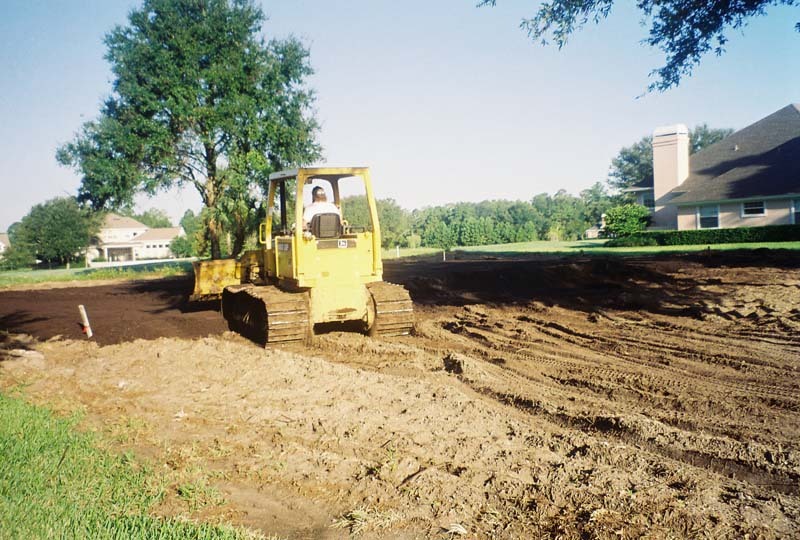 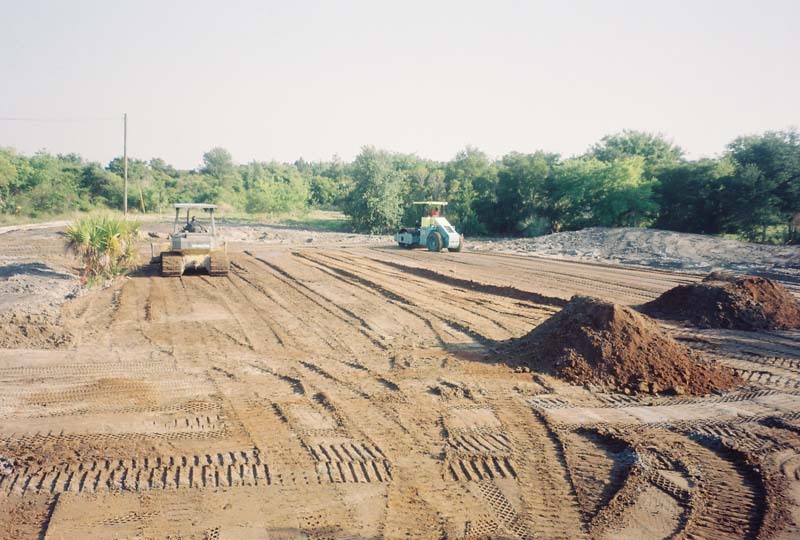 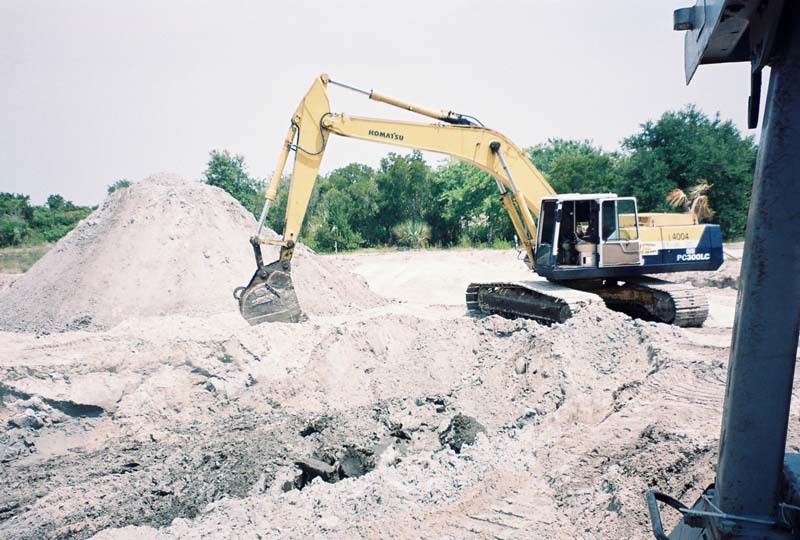 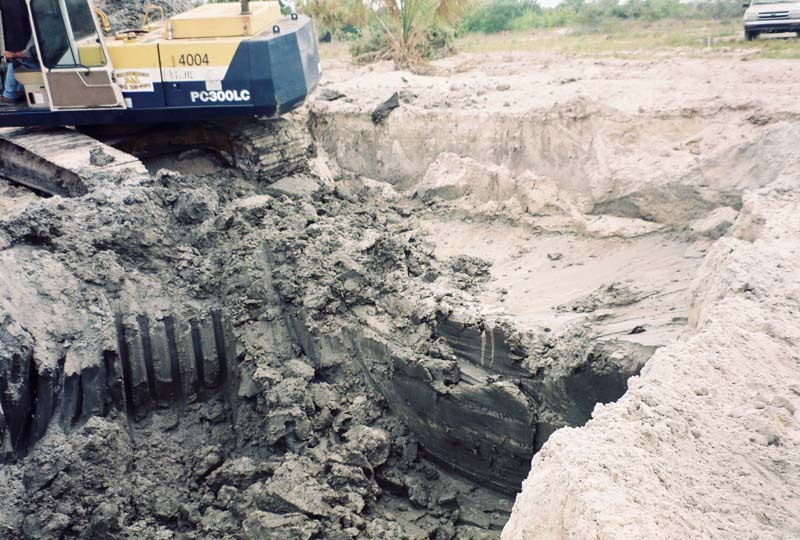 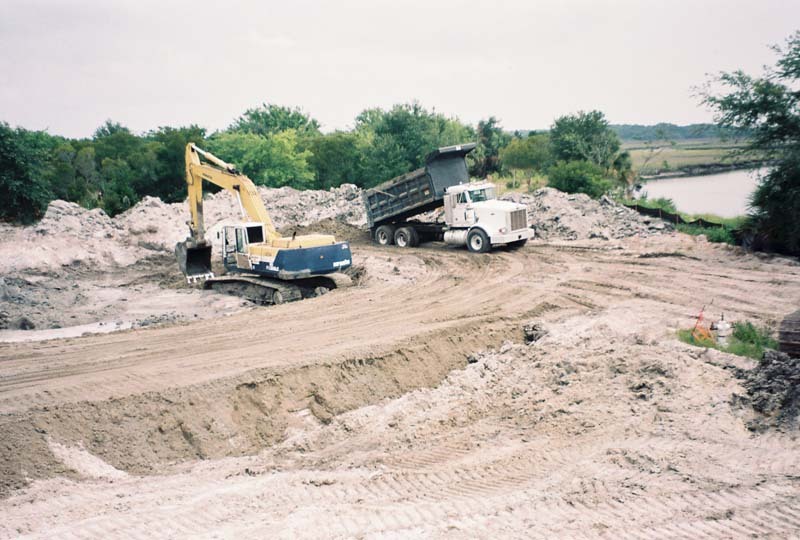 If you are satisfied with our initial plan, we will then competitively bid out to our pool of pre-qualified, quality subcontractors and provide you with a full project proposal that includes cost of construction. 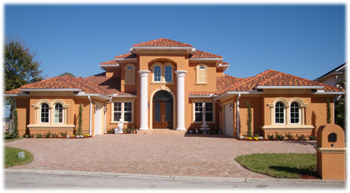 This detailed summary will also include preliminary architectural drawings for your approval. 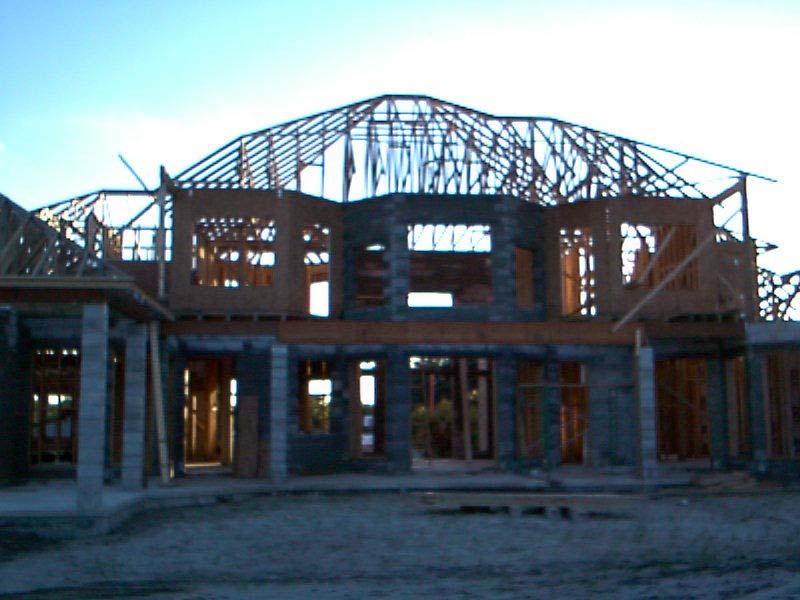 This proposal and plan will be discussed with you personally in order to address any questions or concerns that you may have. 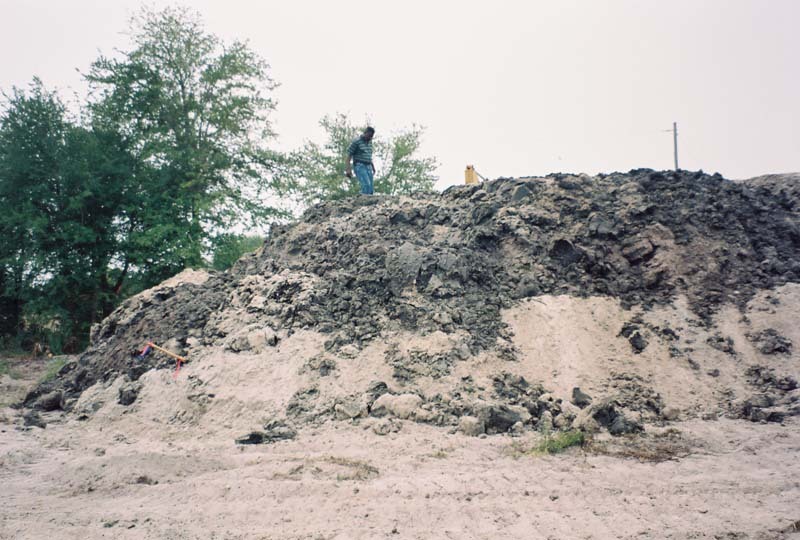 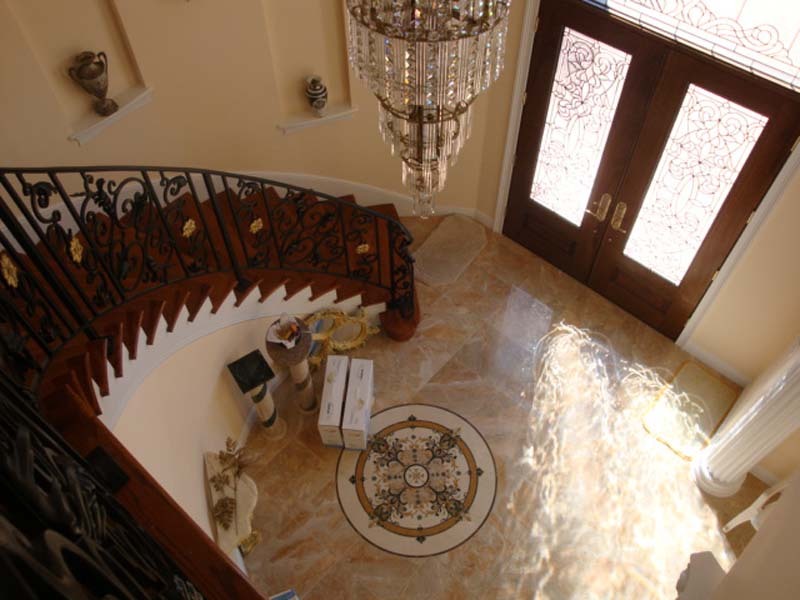 Along with our own highly trained craftsmen and expert oversight, we will ensure that the project adheres to your design specifications, as well as the most stringent quality standards. 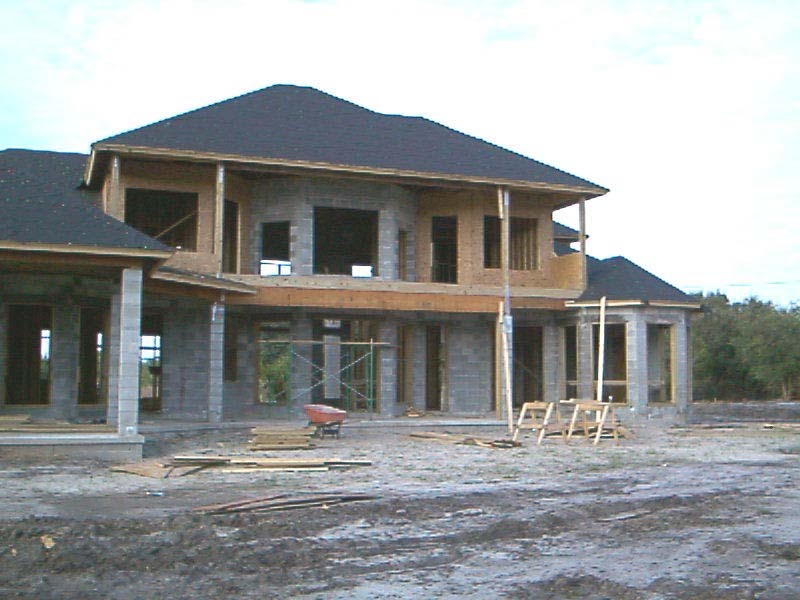 The construction work will be done on a timely basis and on a schedule that best fits your needs. 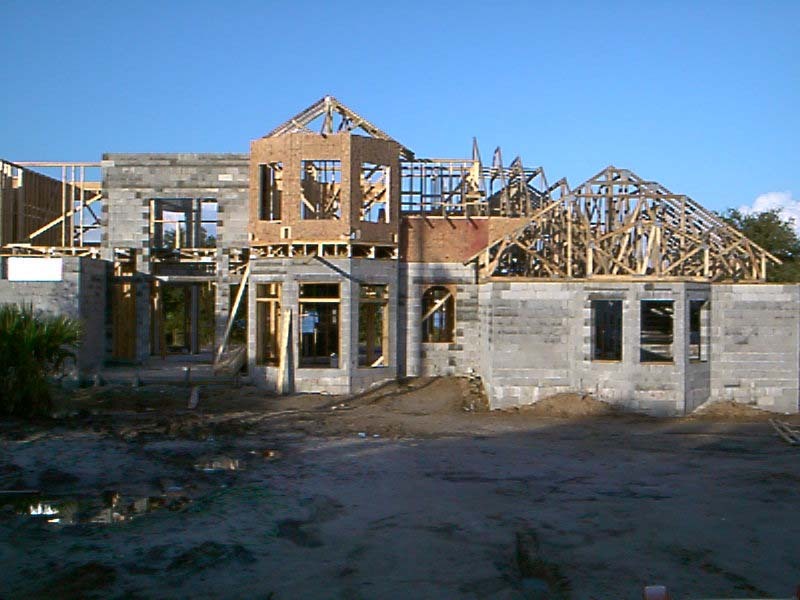 We will do a walk through after framing (prior to insulation) and after completion with you so that you may inspect all work completed. 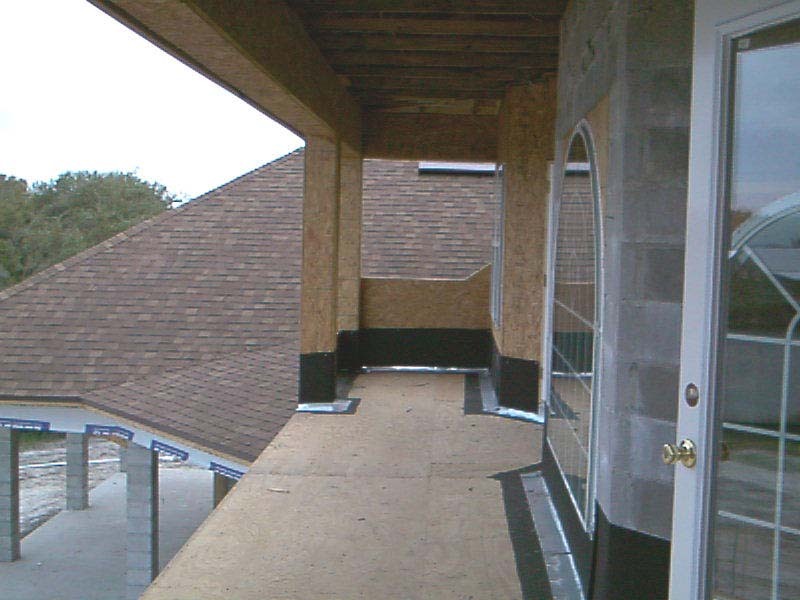 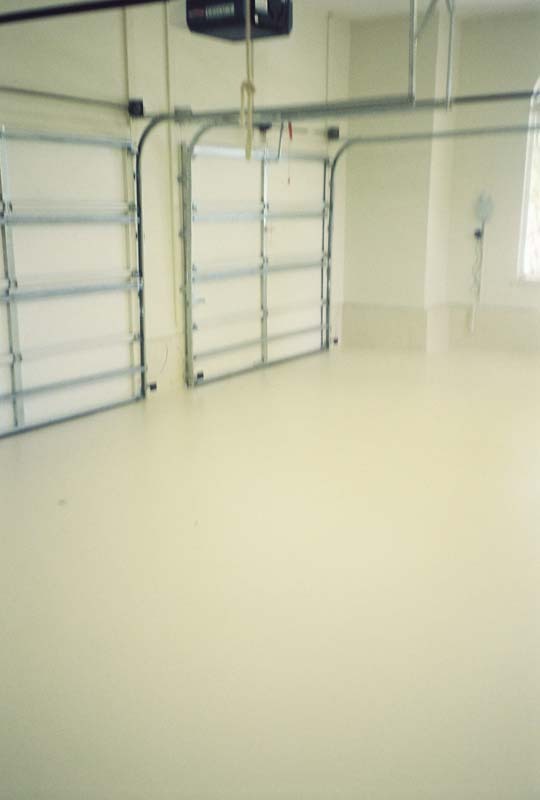 We will also explain and provide manufacturer warranties and guarantees on materials used throughout the project. 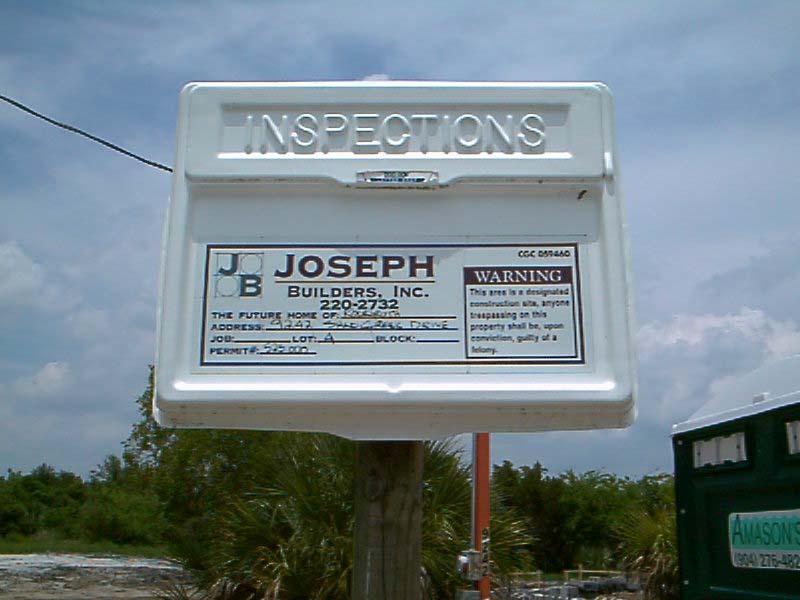 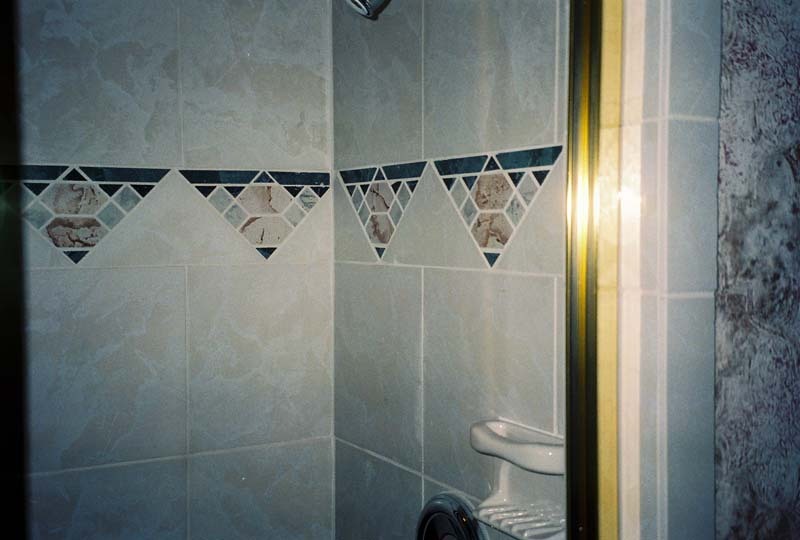 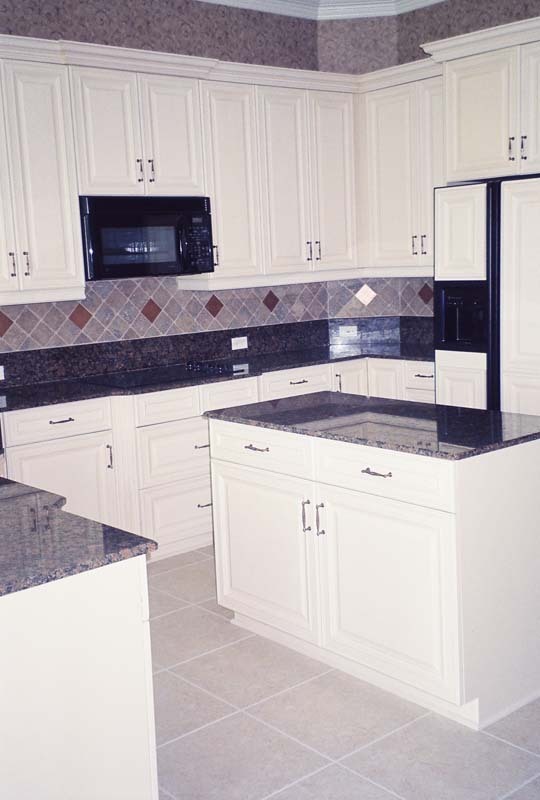 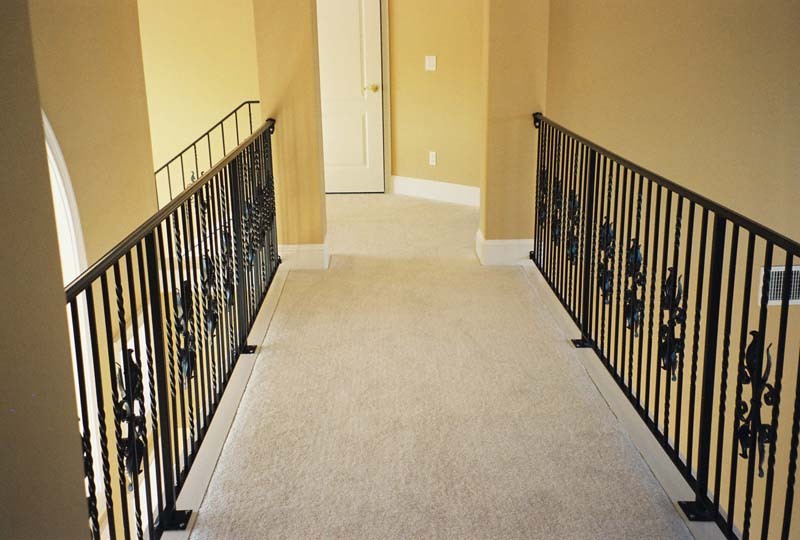 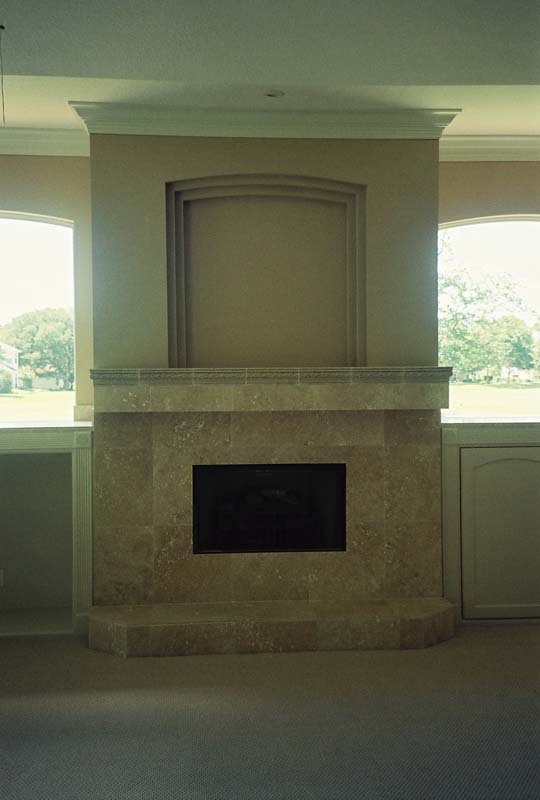 Joseph Builders is dedicated to complete client satisfaction from concept to reality. 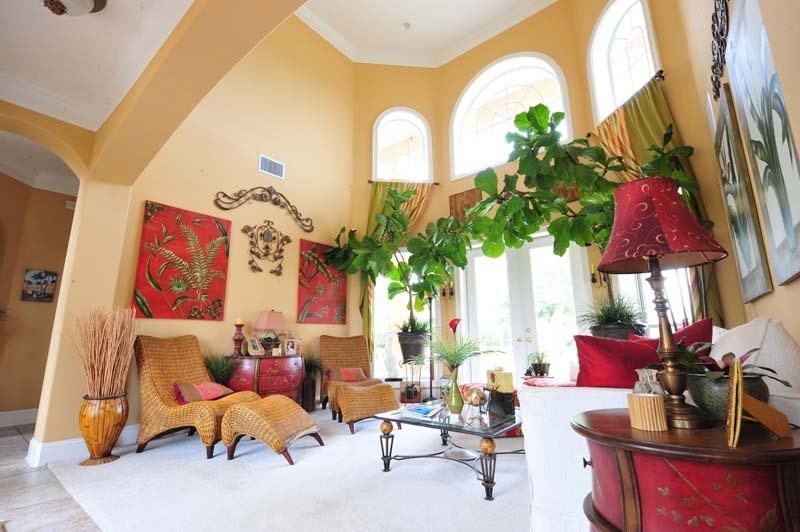 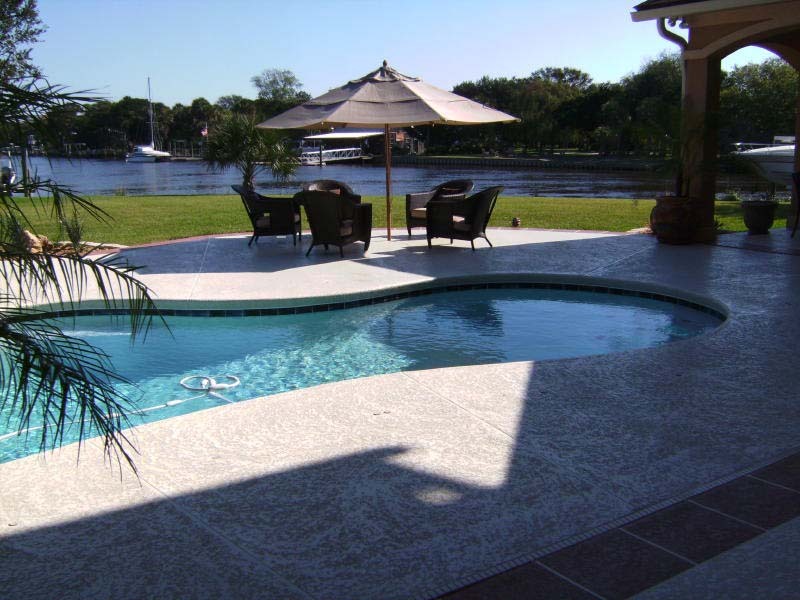 Dave and Nina wanted a Mediterranean home on the water in North Jacksonville, FL. 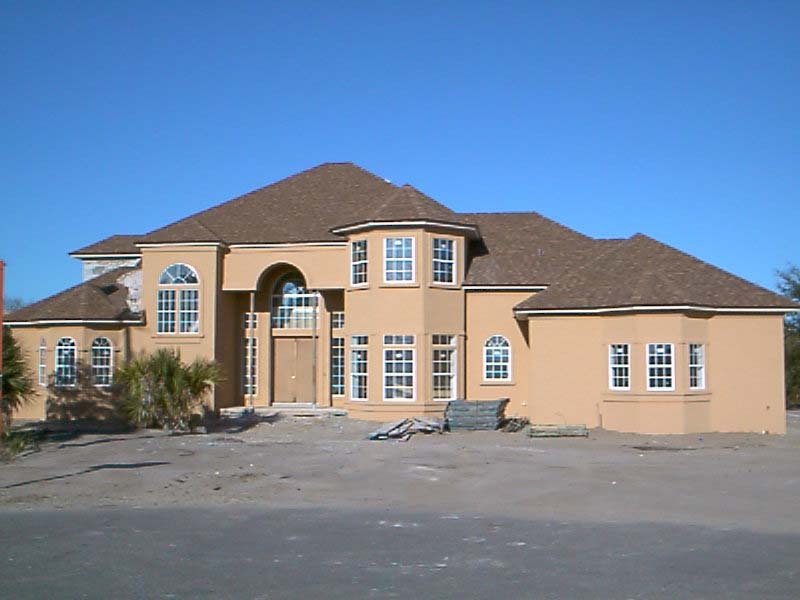 This concrete block with stucco home is 3300 square feet. 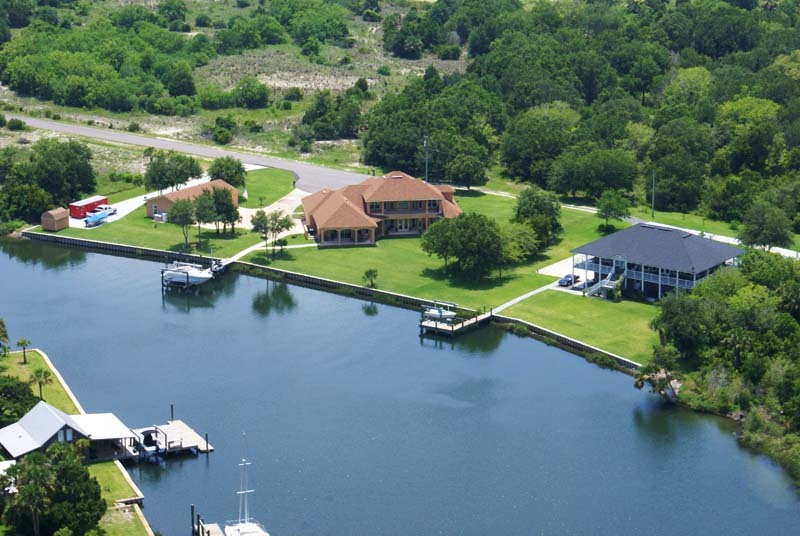 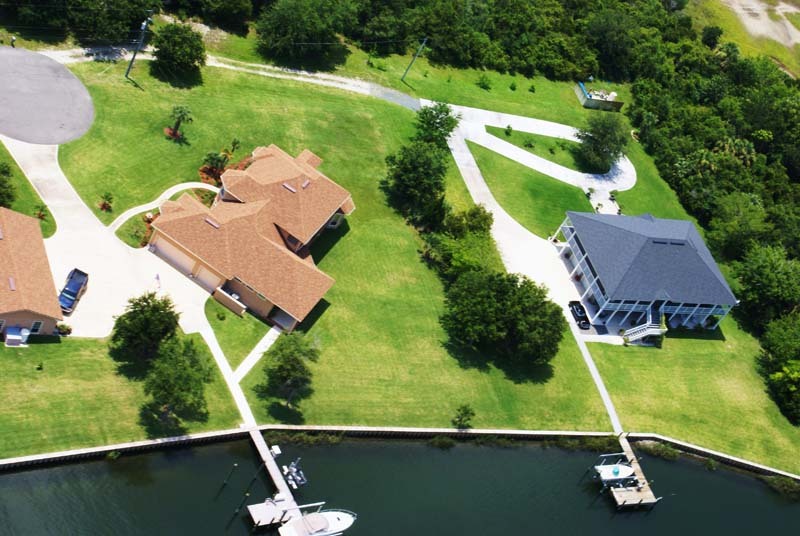 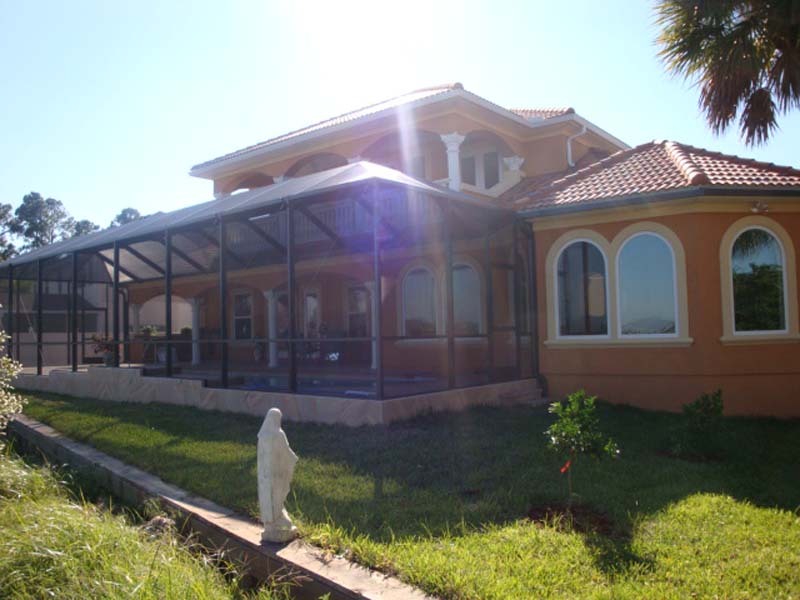 It is located on 1.2 acres with 266 feet of frontage on deep water along with a 1200 square feet detached garage. 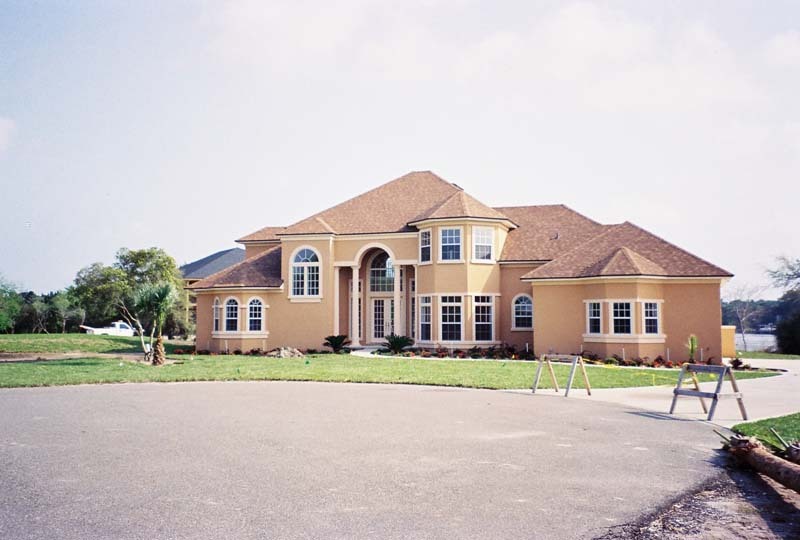 This was their dream turned into reality by Joseph Builders. 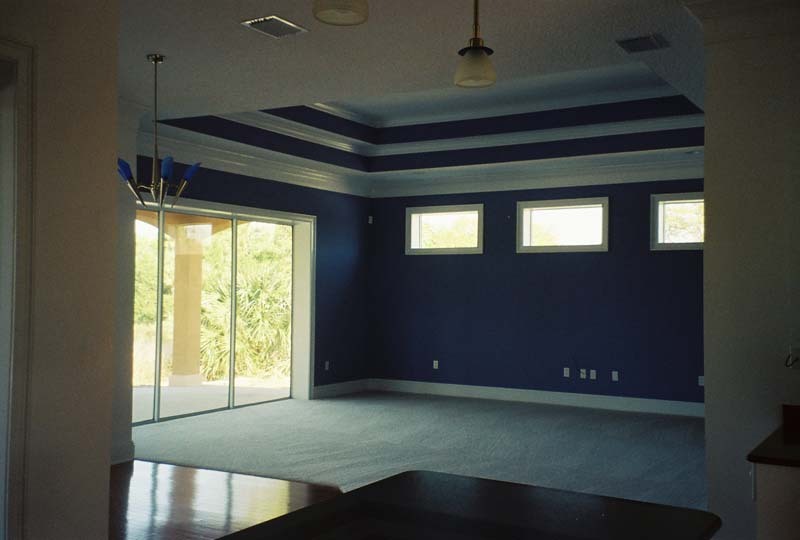 The soaring ceilings in the family room give way to a wide expanse of windows and French doors overlooking the water and pool. 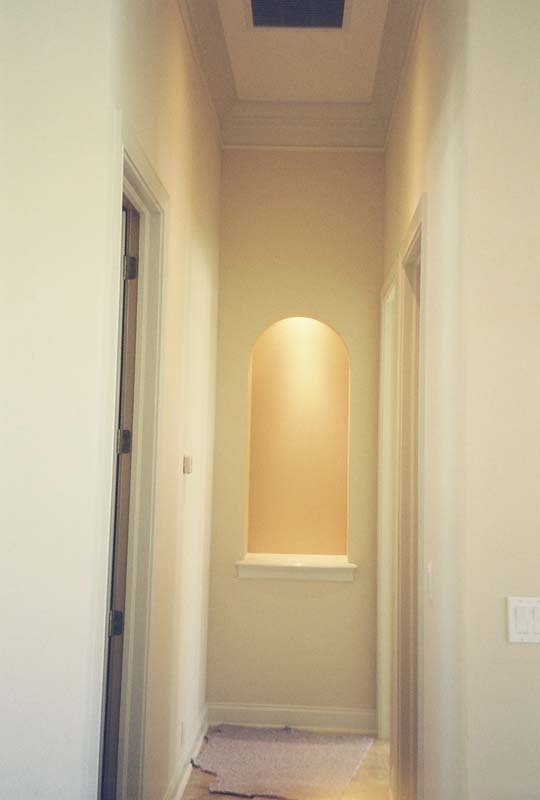 A hallway leads into the master bedroom and bathroom suite complete with his and hers walk-in closets. 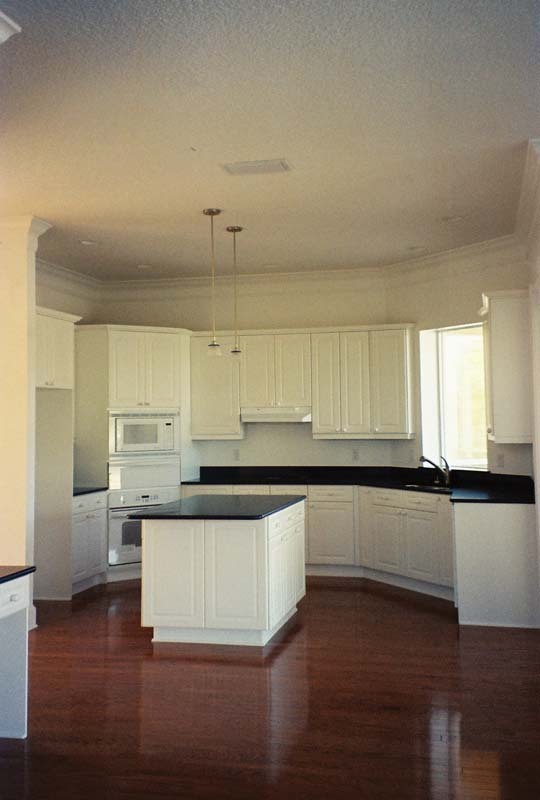 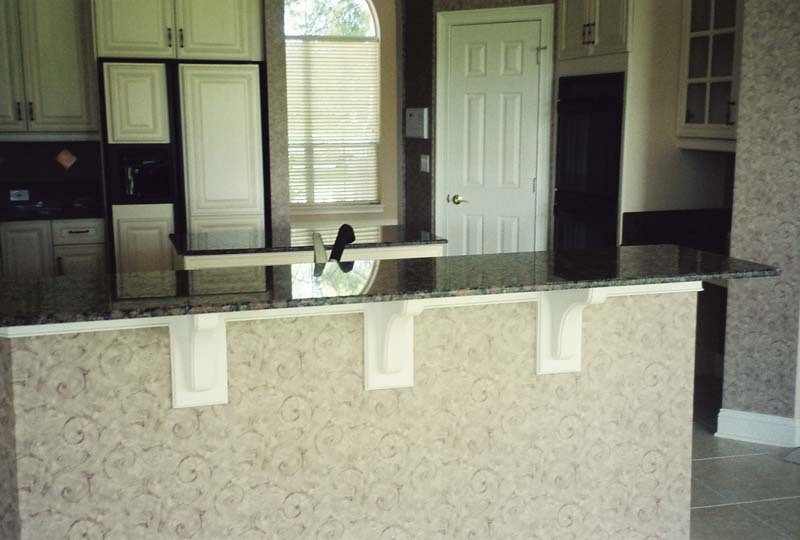 The home has a great flow for entertaining between the dining room, kitchen, bath, and family room. 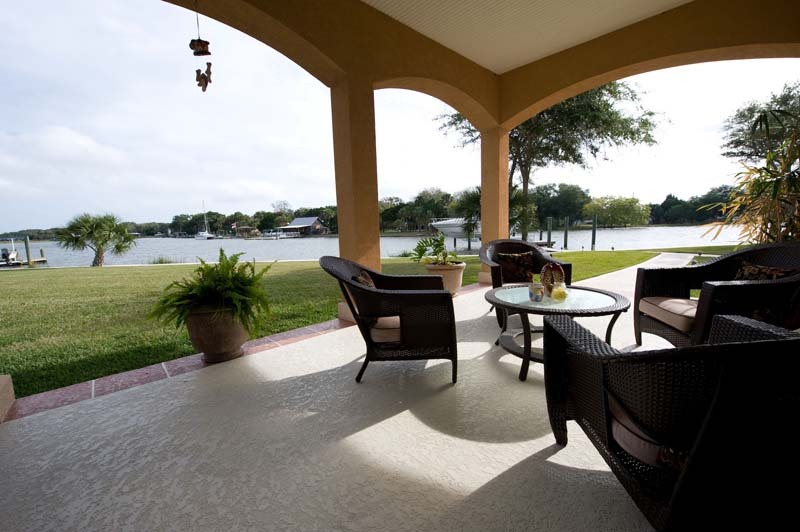 The covered porch adjacent to the family room offers extended living space to enjoy the water views and entertain outdoors. 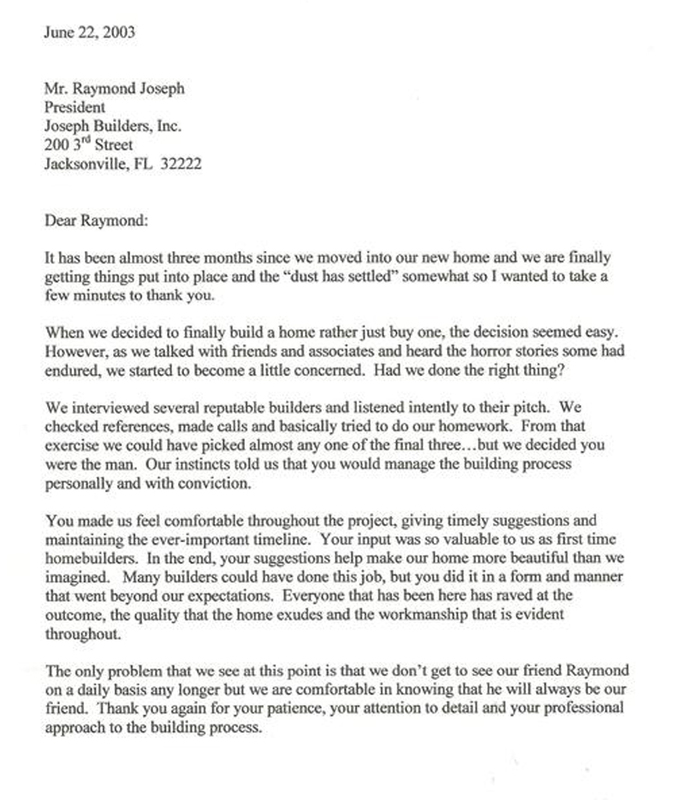 Click Here to read a letter of recommendation from the homeowner. 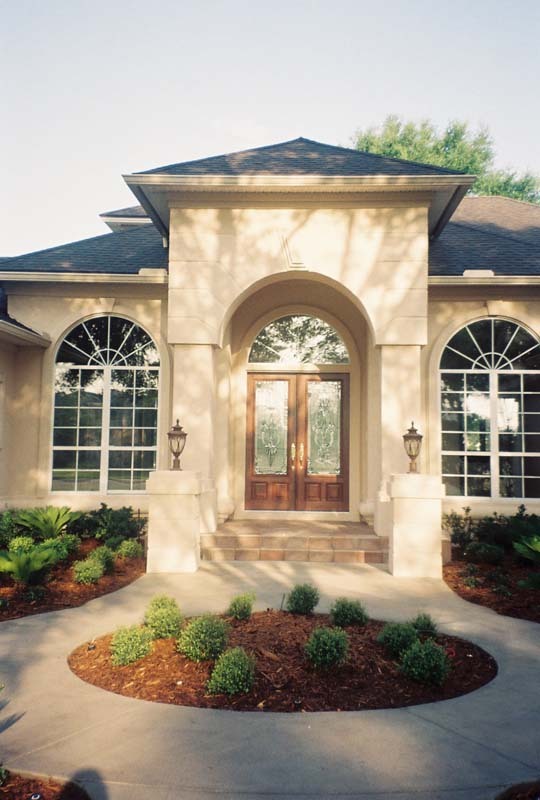 Forrest and Amira envisioned a Mediterranean Style home on the river in Jacksonville, FL. 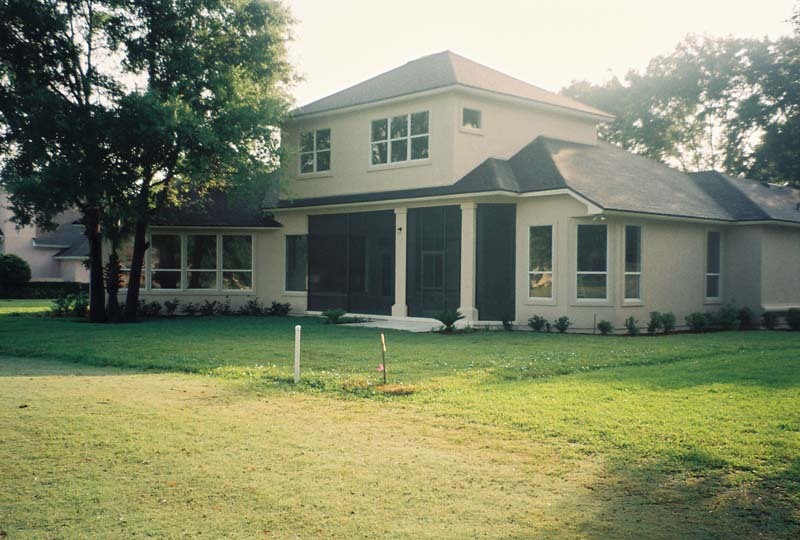 This is their second custom home built by Joseph Builders. 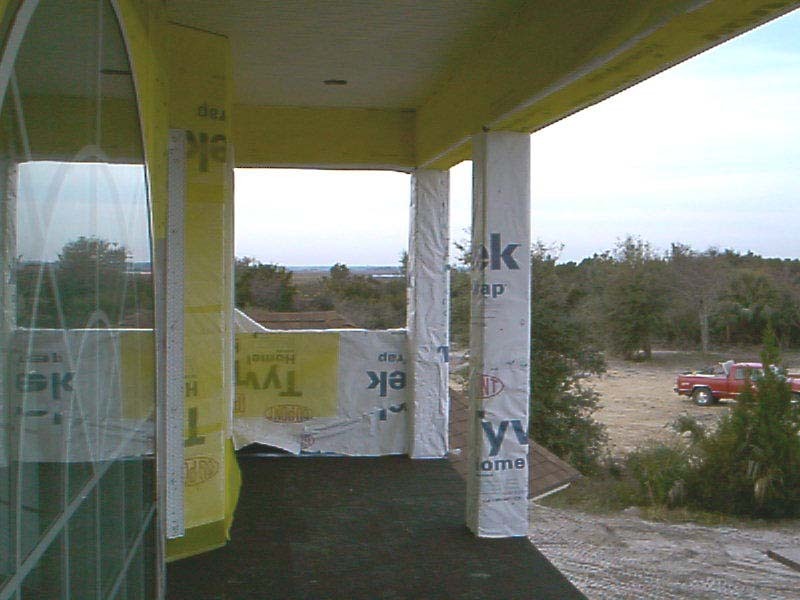 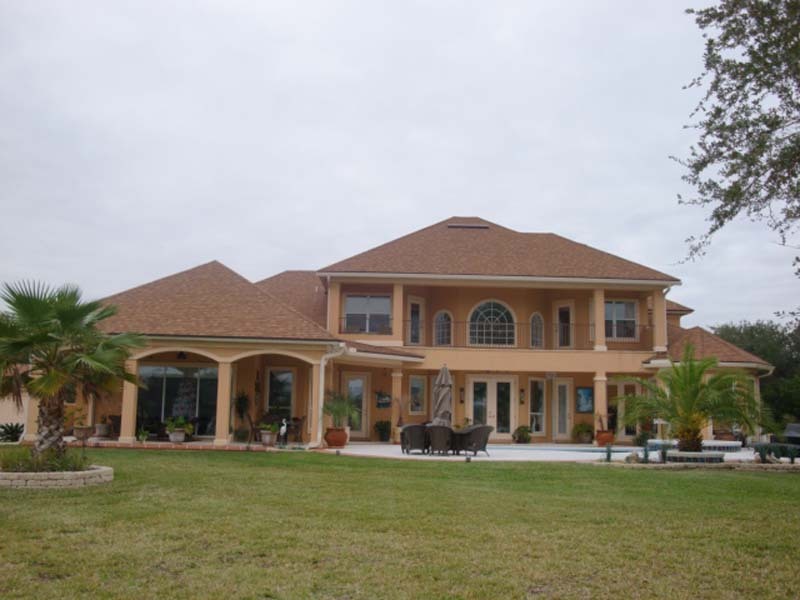 This 4500 square foot home is concrete block and wood framing with applied stucco exterior. 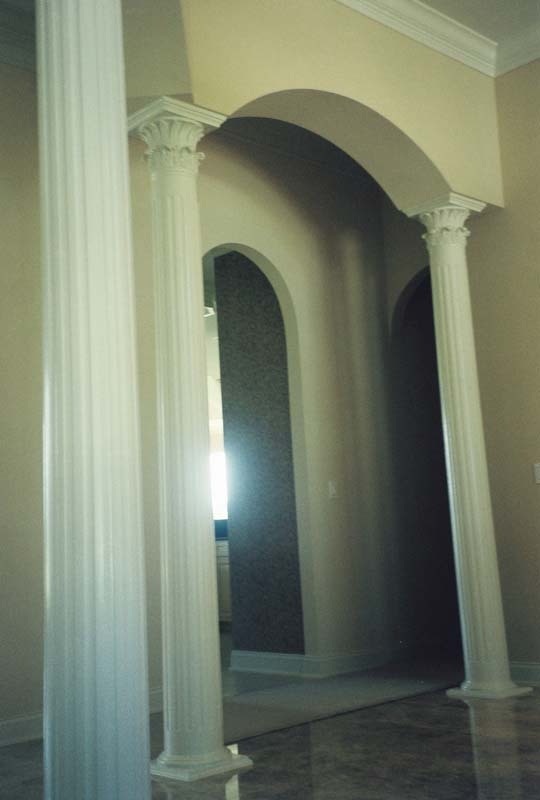 The home has 16 columns and balustrades overlooking the river in Jacksonville, FL. 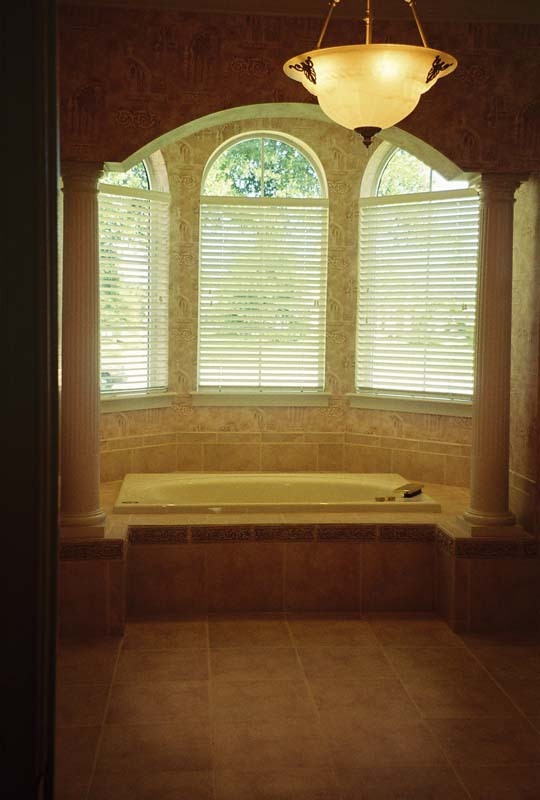 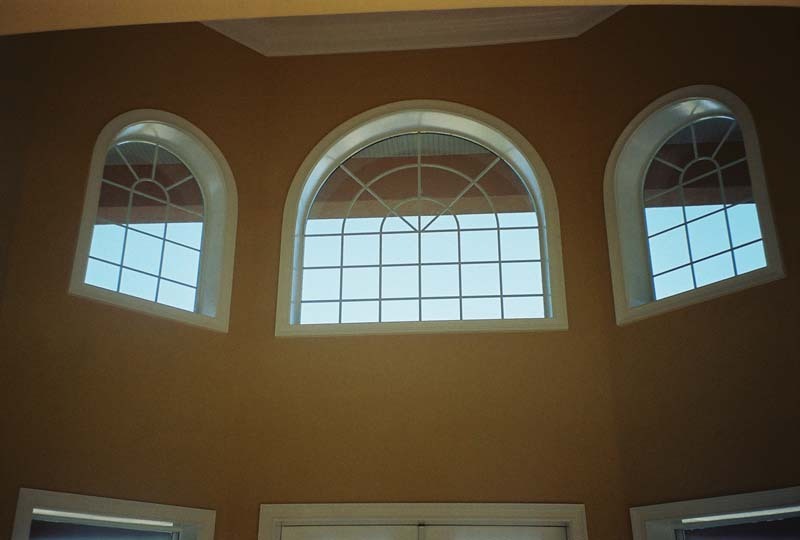 Joseph Builders used beautiful windows and detailed interior crown for the key design elements in this new custom built home. 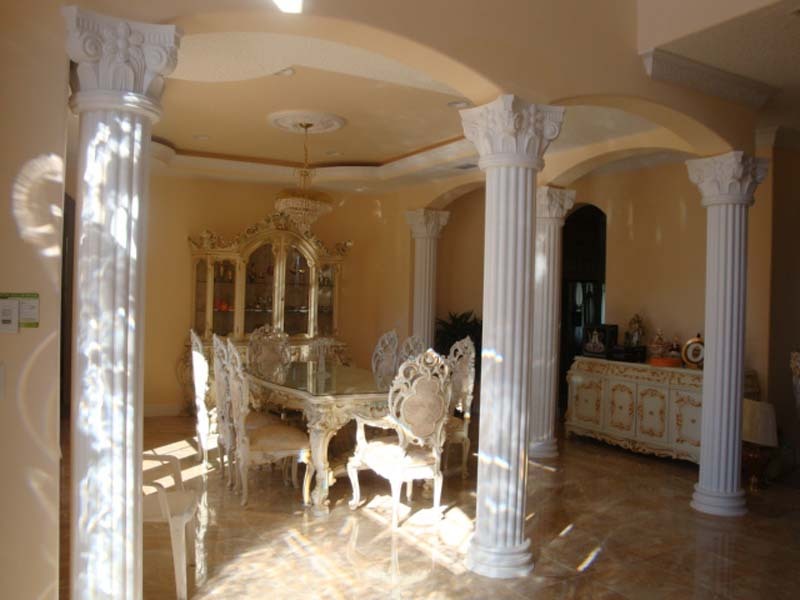 The Italian marble entry foyer is highlighted on one side by an elegantly curved staircase featuring niches on the walls and on the opposite side by round columns boldly defining the dining area. 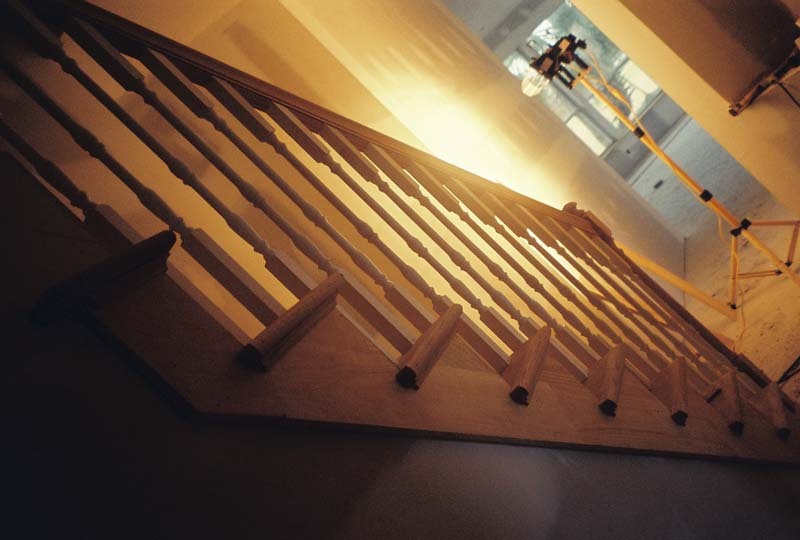 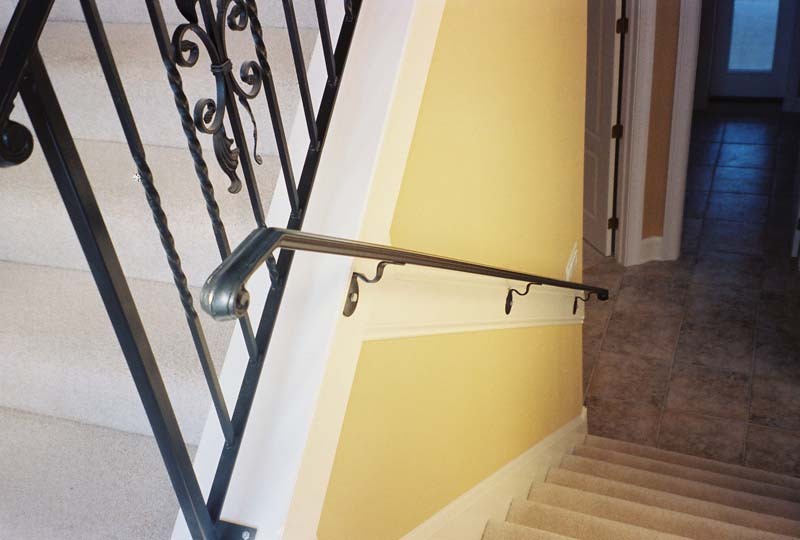 The second floor can be accessible by elevator for that comfortable ride going upstairs. 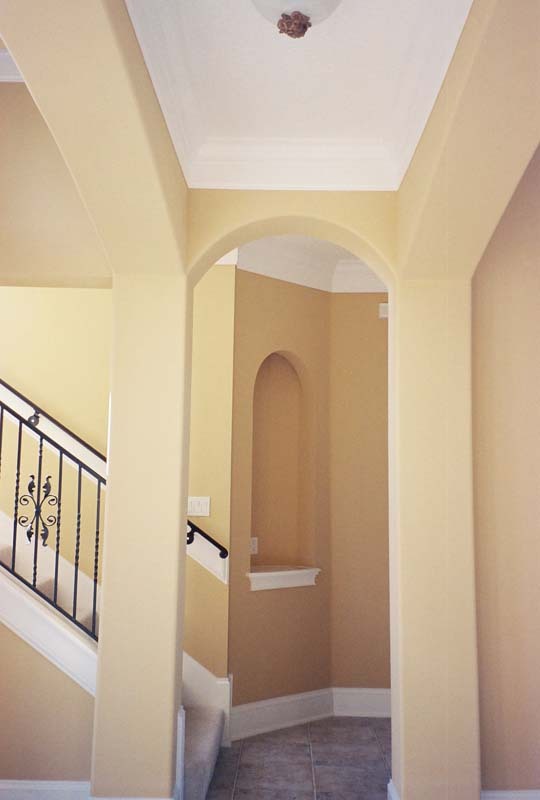 The soft, neutral, and earth tone colors work well with the Mediterranean style. 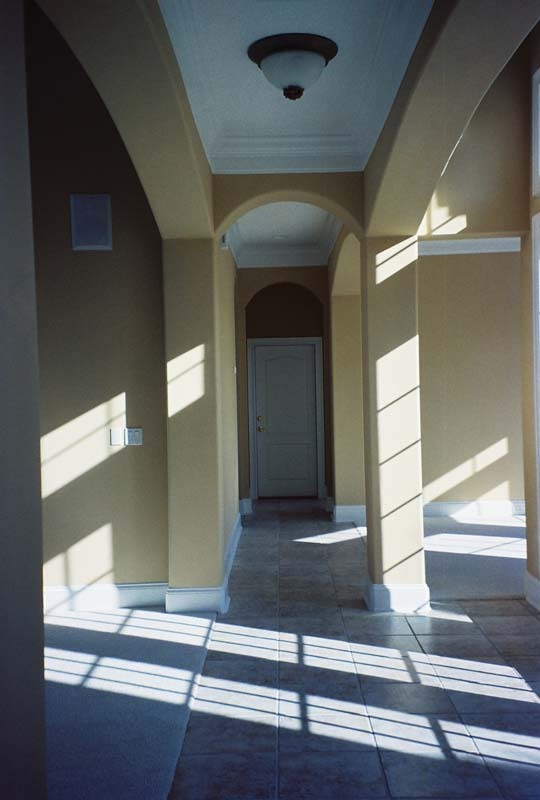 The front porch with the transom is a perfect entrance into the two story front foyer showcasing the main stairwell the moment you step inside. 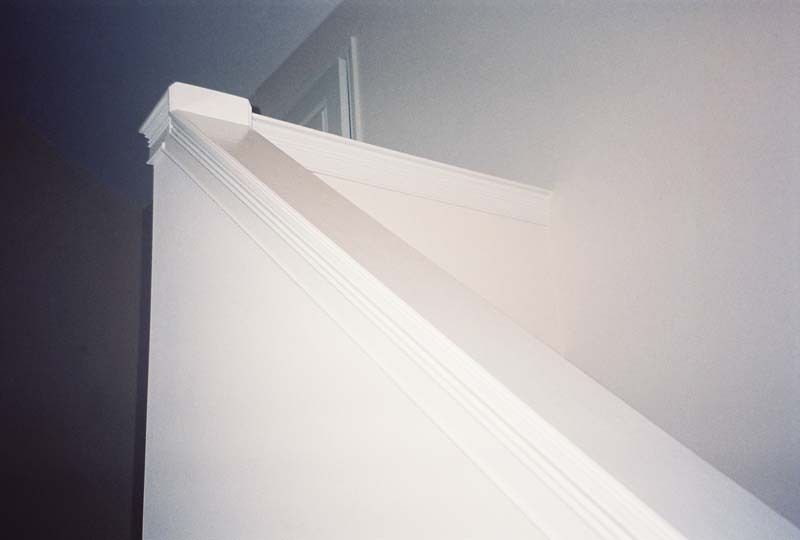 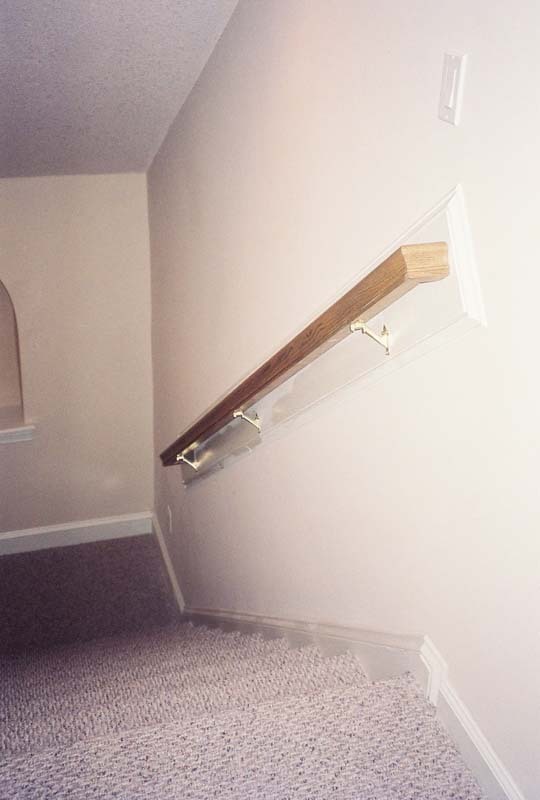 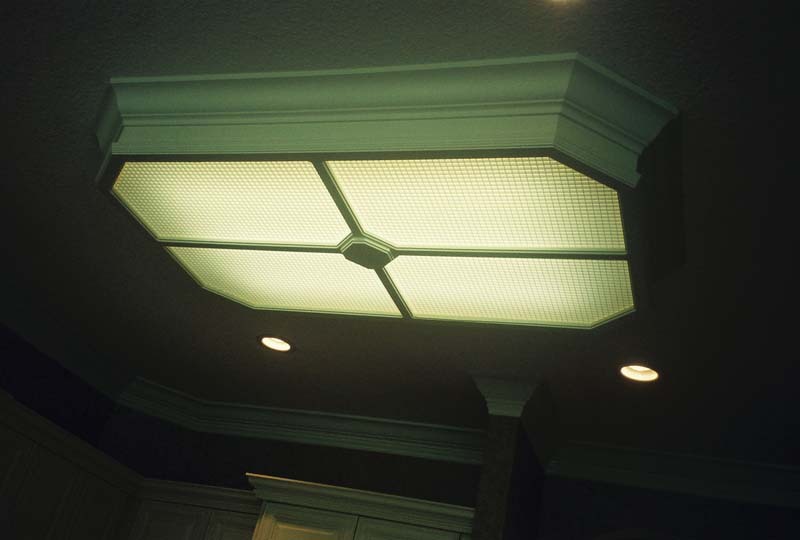 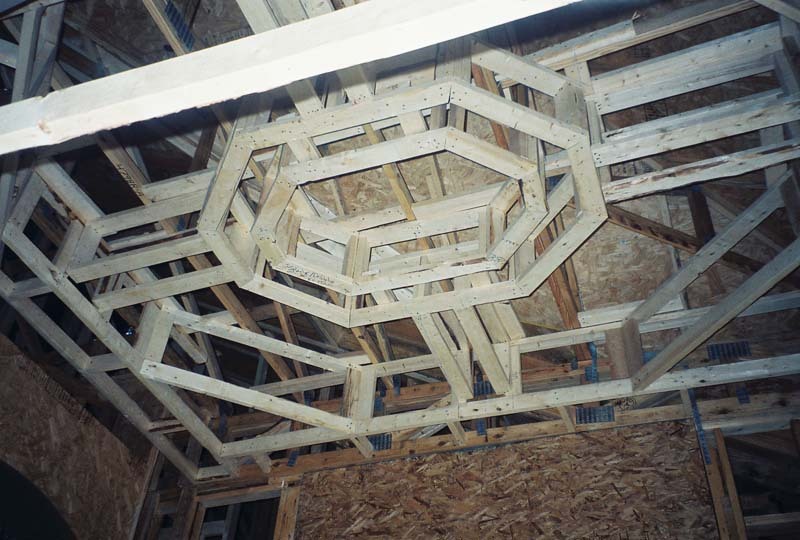 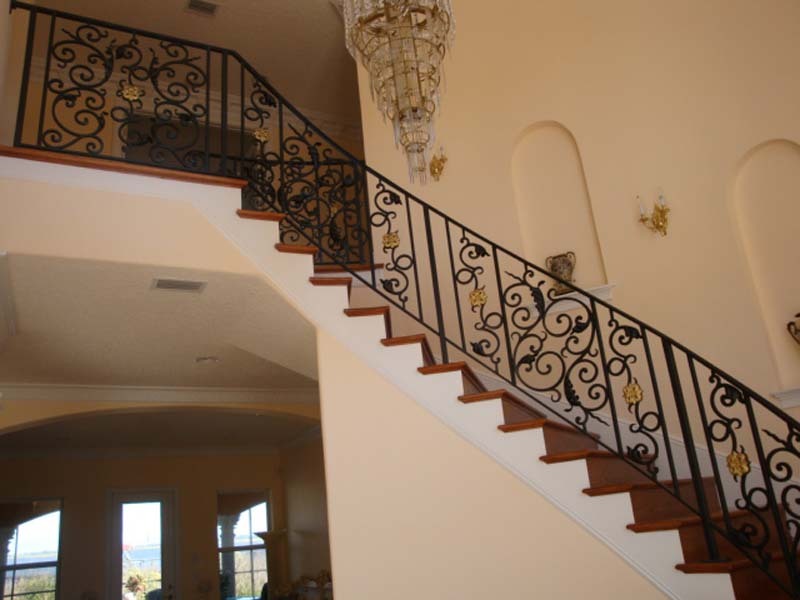 Throughout the house the attention to details in the custom crown is evident. 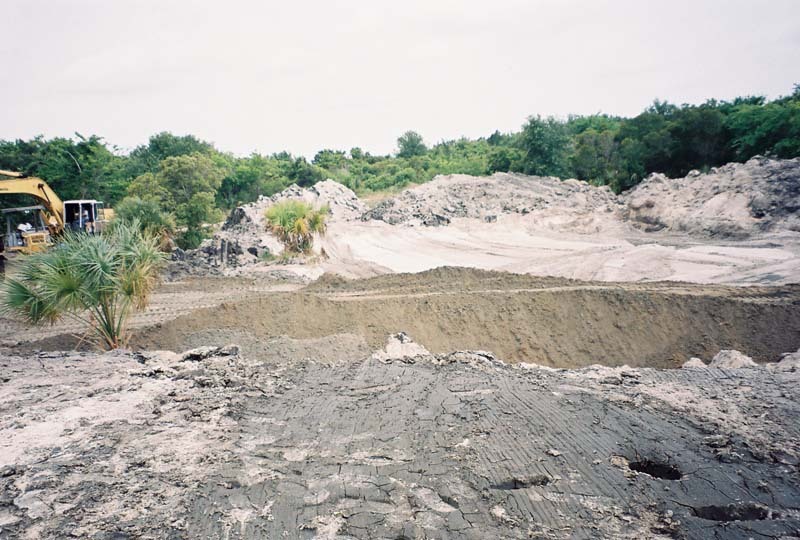 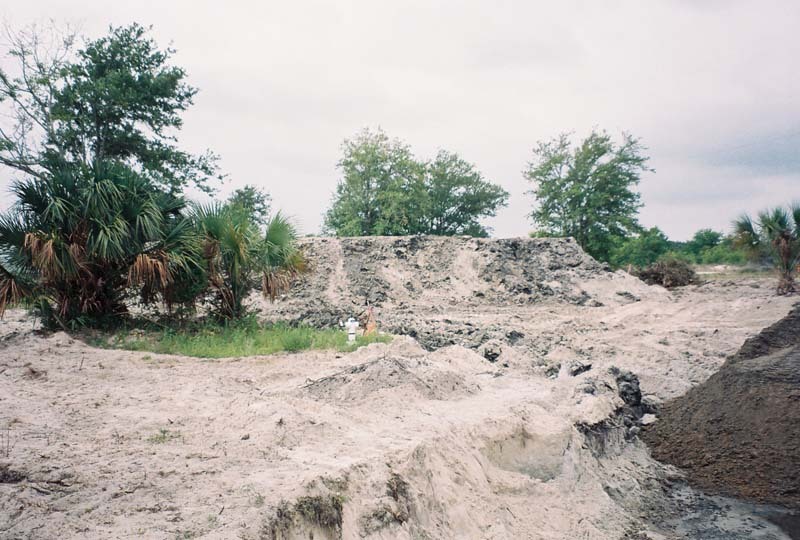 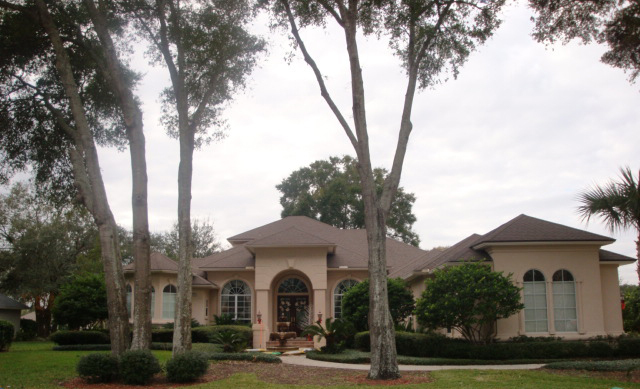 Michael and Madeline were looking at pre-existing homes in Jacksonville, FL for two years. 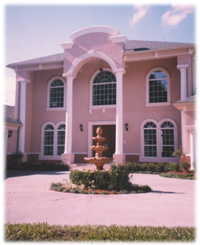 Theywanted a unique Mediterranean Style home and a custom home builder to make their dreams a reality. 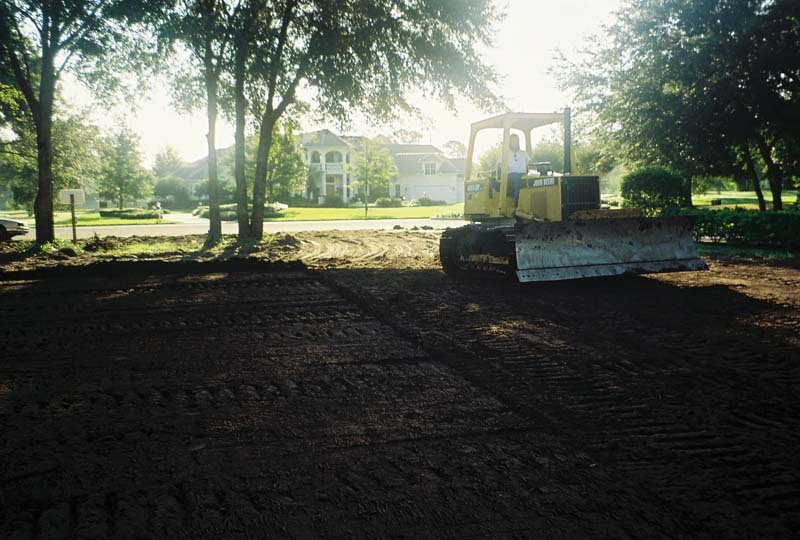 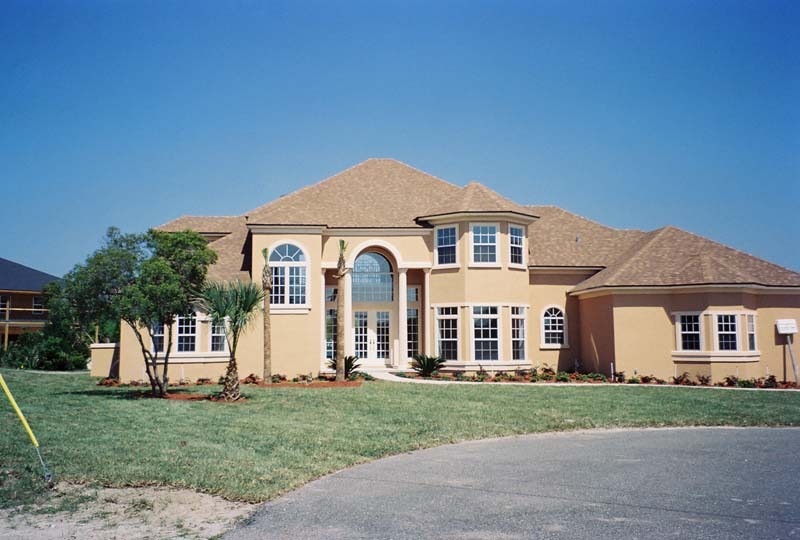 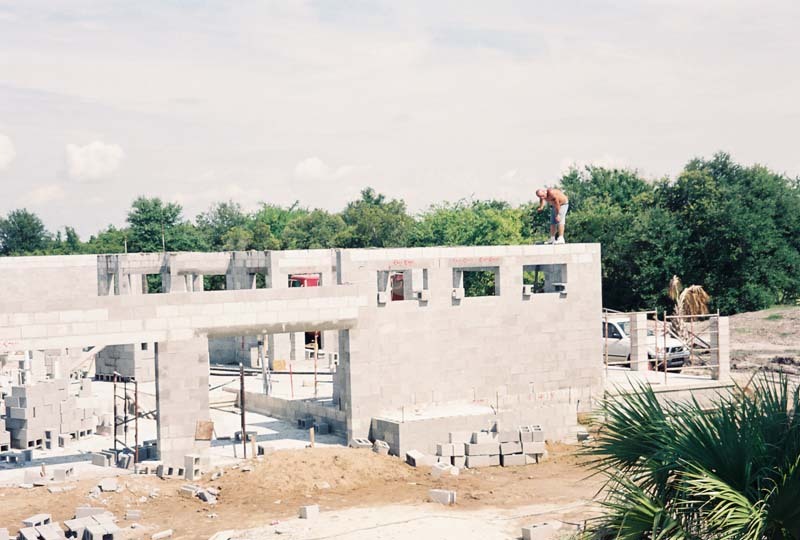 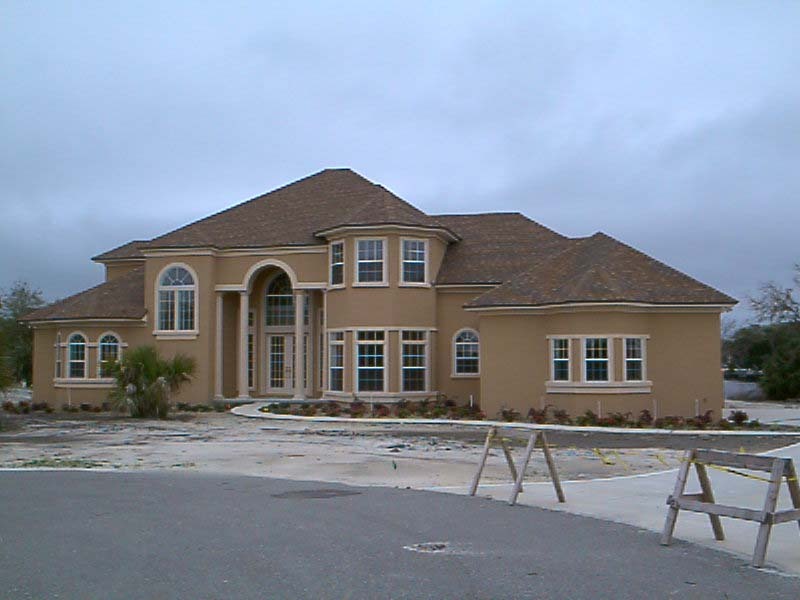 This 4200 square foot is concrete block and wood framing with applied stucco exterior overlooking the fairway in a gated golf community in Jacksonville, FL. 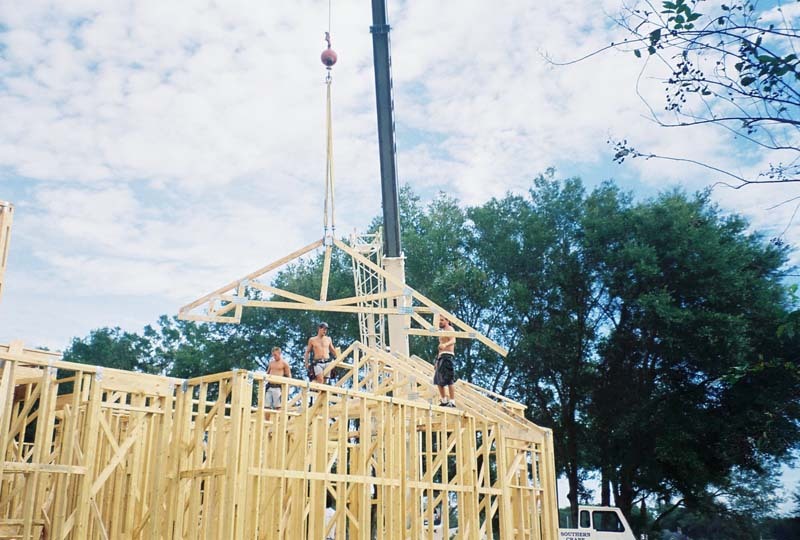 Joseph Builders turned their dreams into reality. 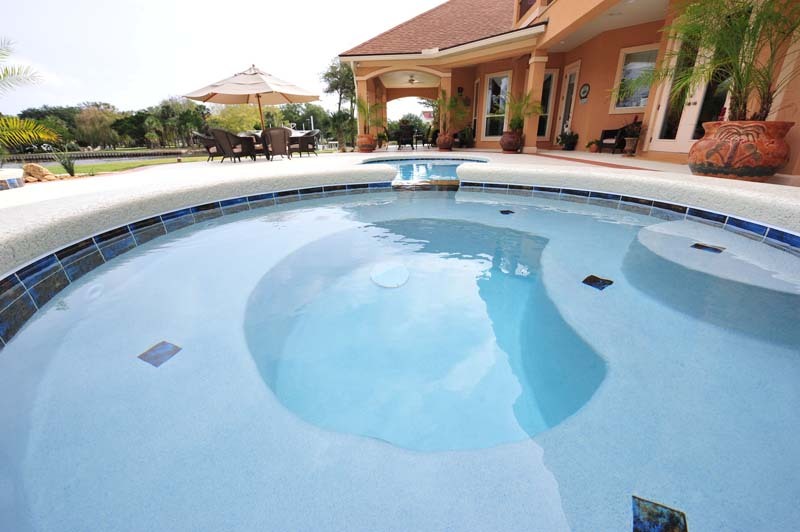 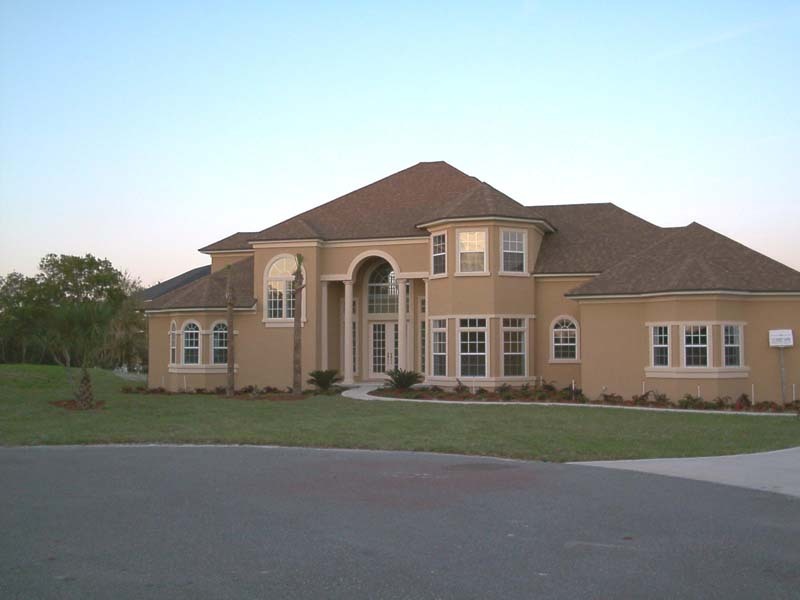 The home has an open floor plan which makes it roomy and great for entertaining. 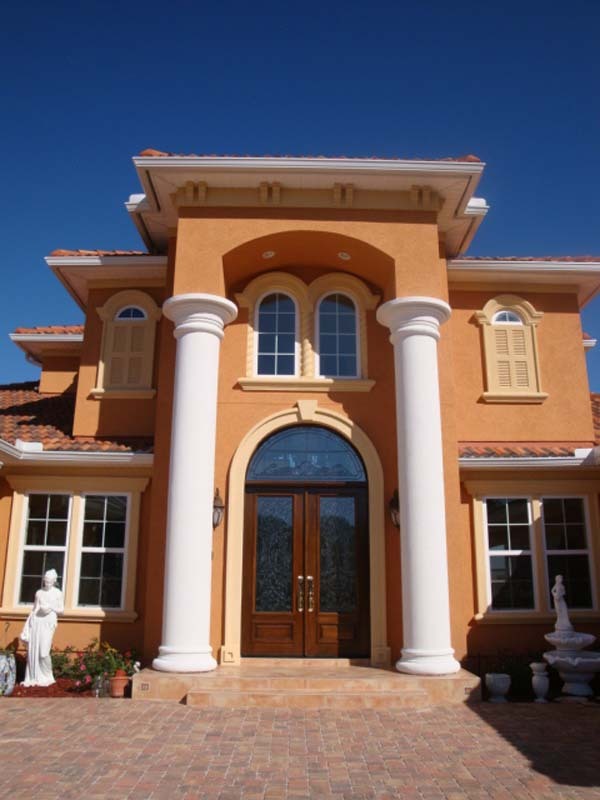 The arched entrance is accompanied with a lion fountain and a solid mahogany wood door. 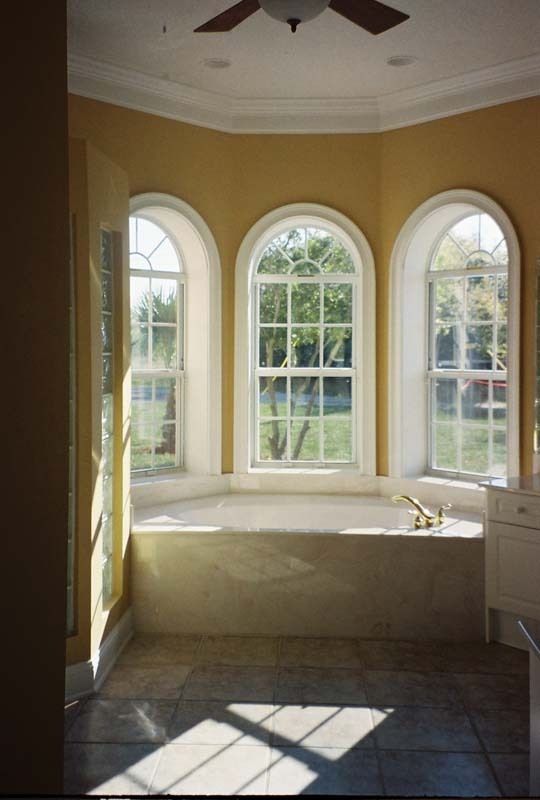 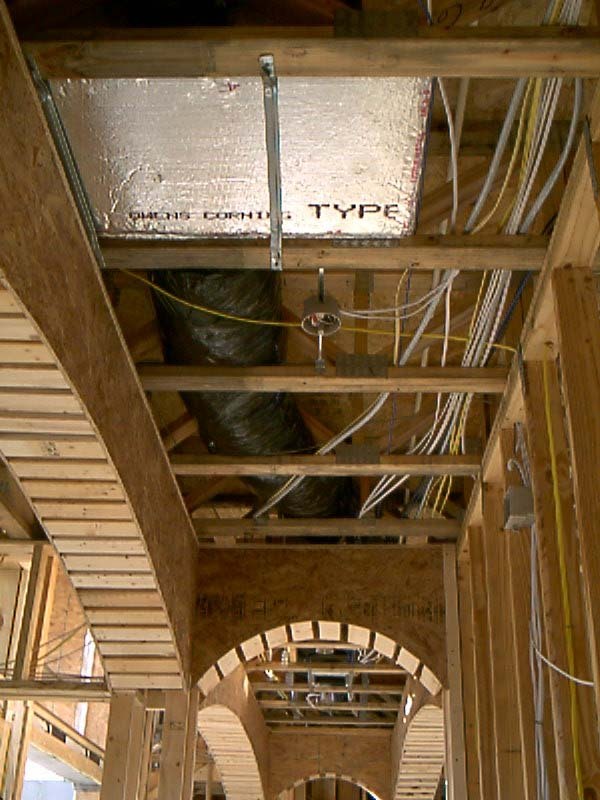 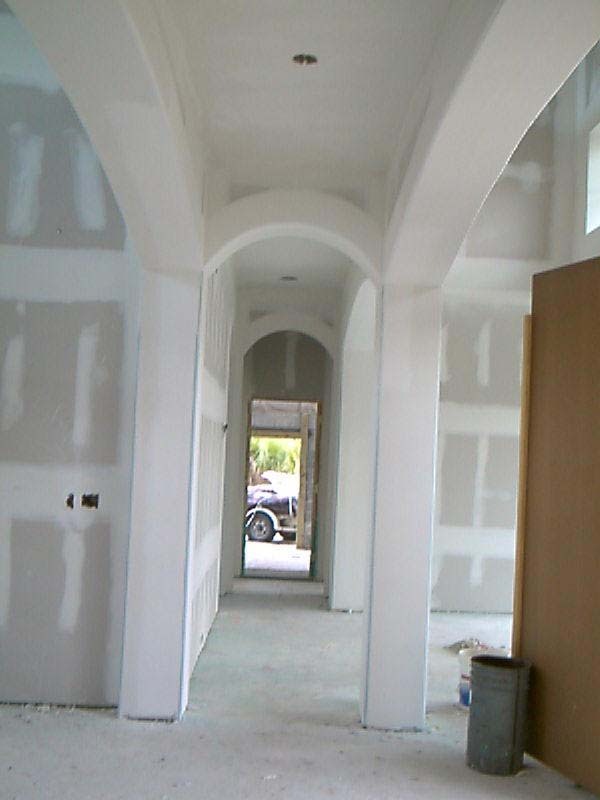 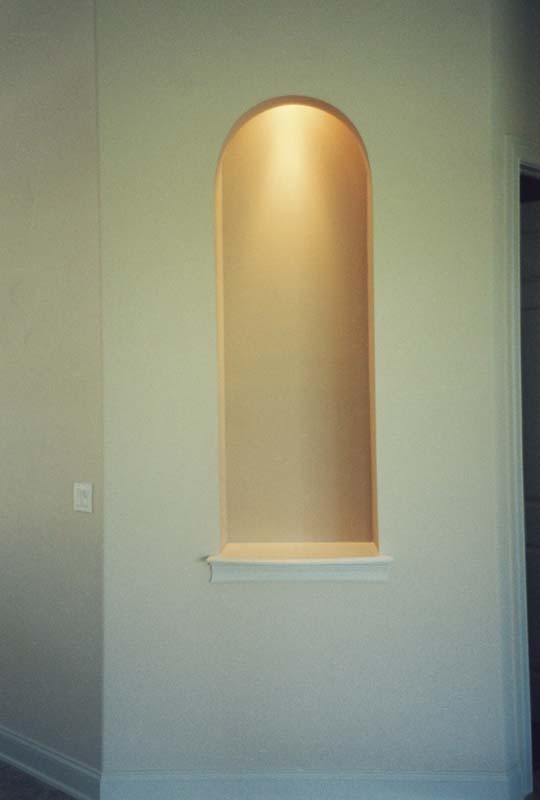 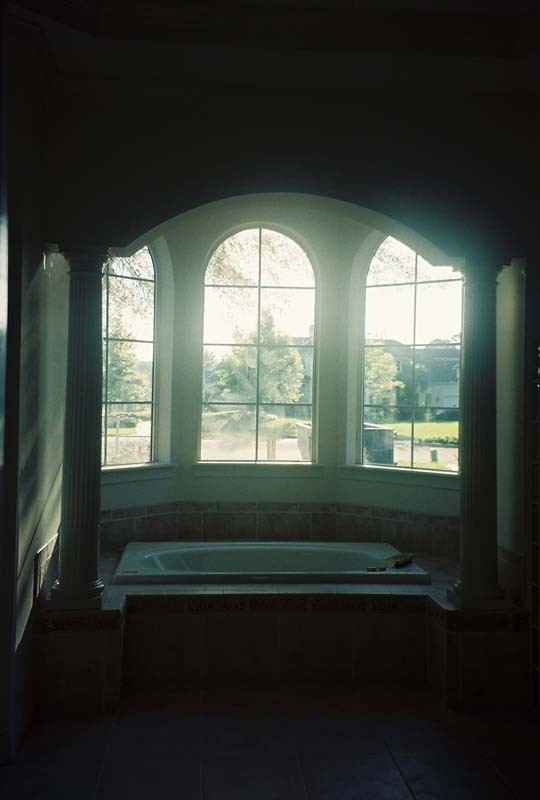 Joseph Builders installed arched windows and a custom recessed ceiling in the dining room for a stunning look. 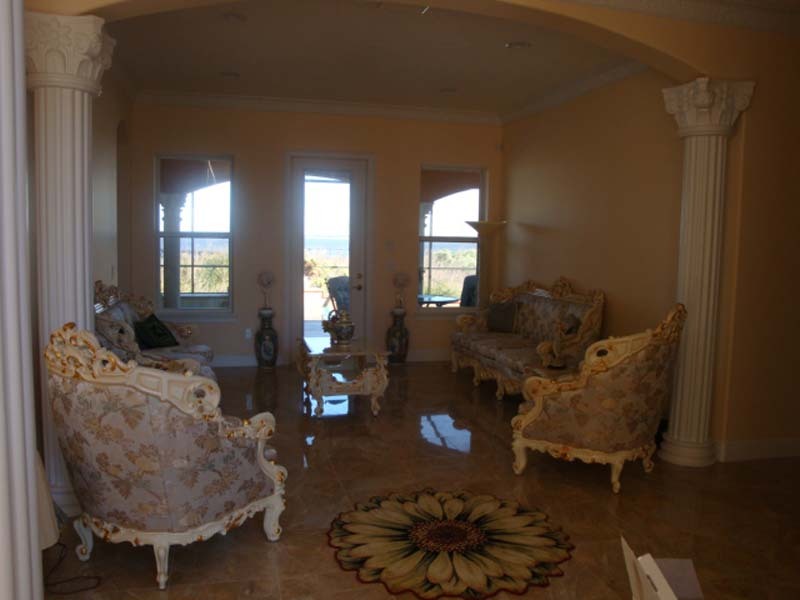 The soft, neutral, and earth tone colors work well with the Mediterranean style. 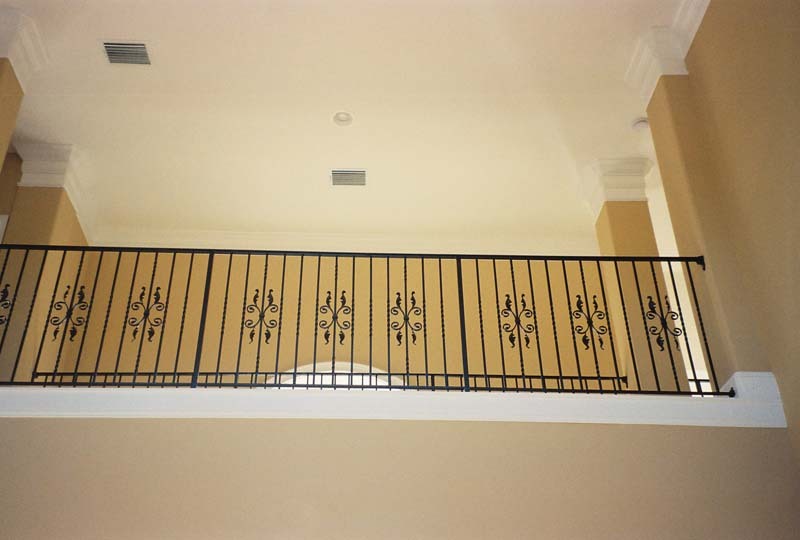 A balcony with an iron railing overlooks the water. 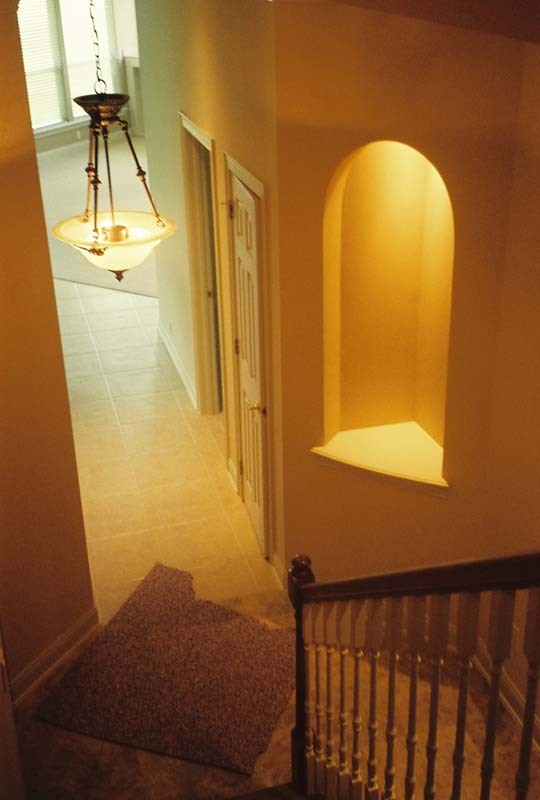 A perfect entrance into the two story front foyer showcases the main stairwell the moment you step inside. 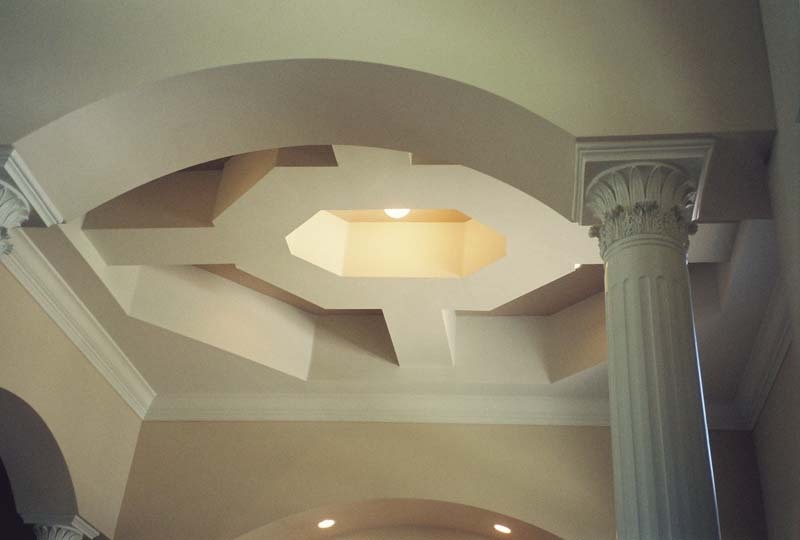 Throughout the house the attention to details in the custom crown is evident. 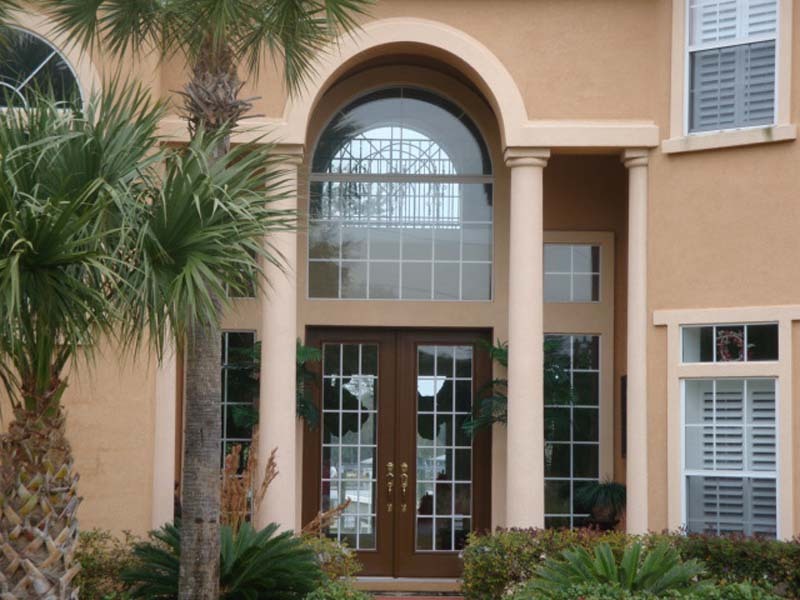 John and Susan wanted to create a “Craftsman” style front entry into their home in Atlantic Beach, Fl. 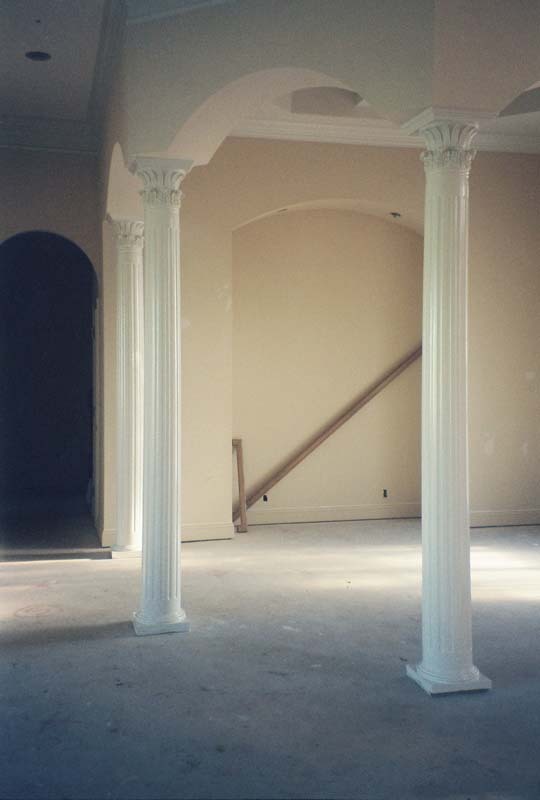 Joseph Builders accomplished their wishes by constructing a new gabled roof over the proposed entrance and installing columns with “Craftsman” bases on top of stone pedestals. 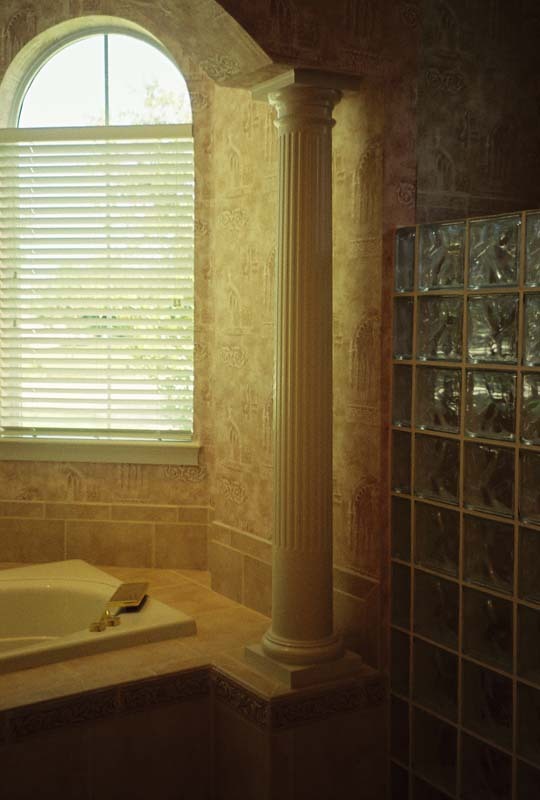 The stone matched the original stone on their house. 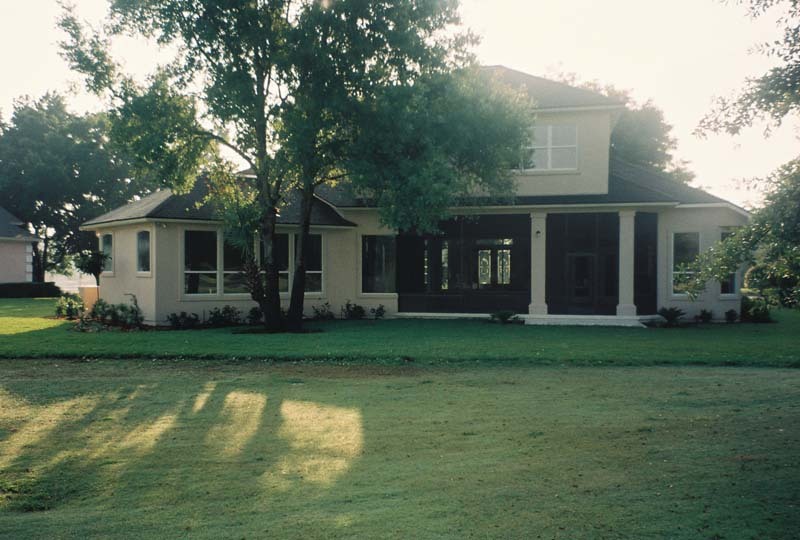 The front doors are mahogany with a “Craftsman” style. 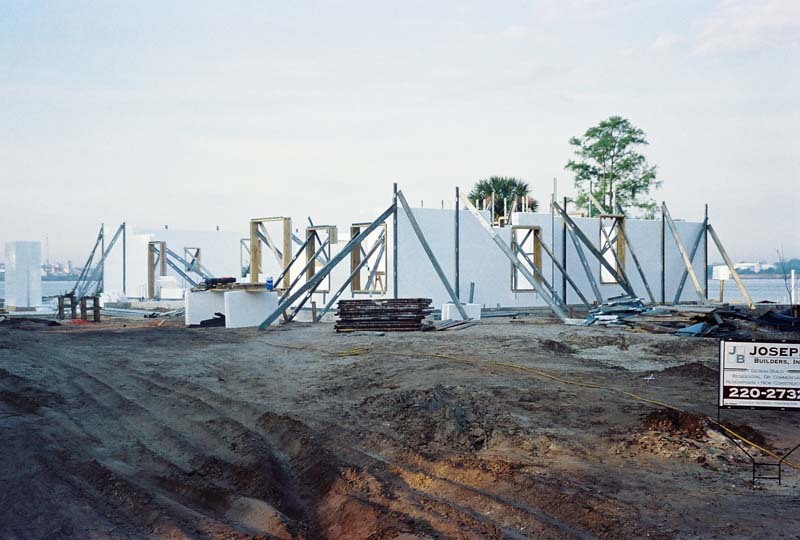 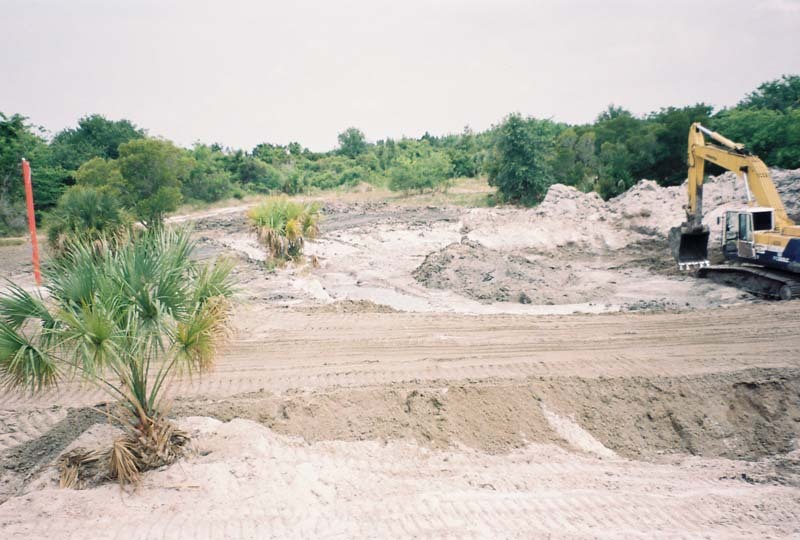 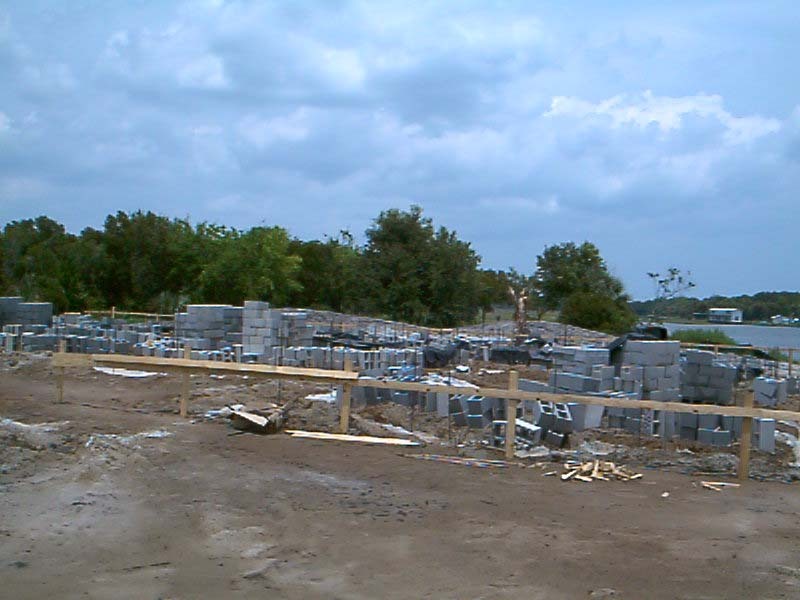 Samantha wanted an ICF (insulated concrete foam) home for its superior design strength and insulated walls on the river in Jacksonville, FL. 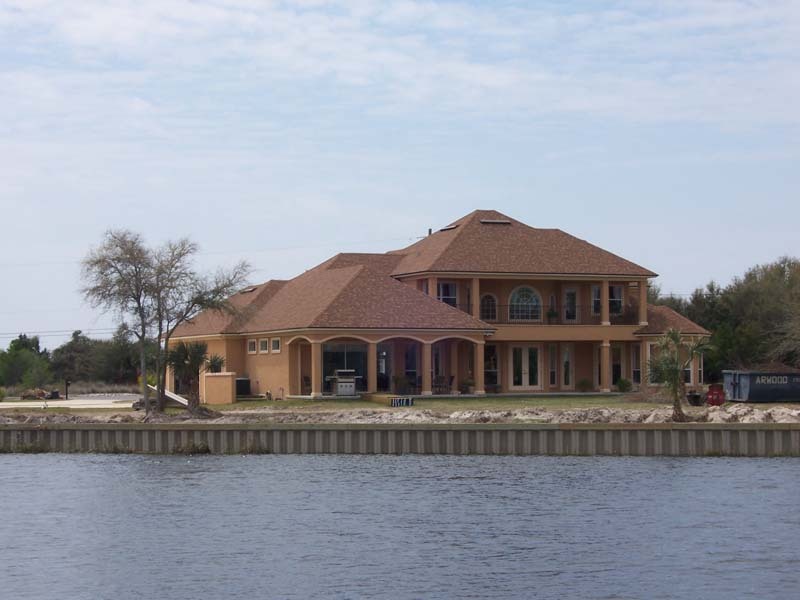 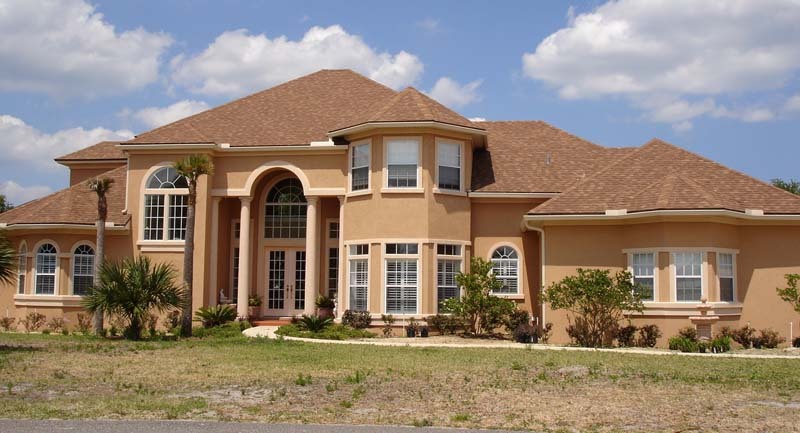 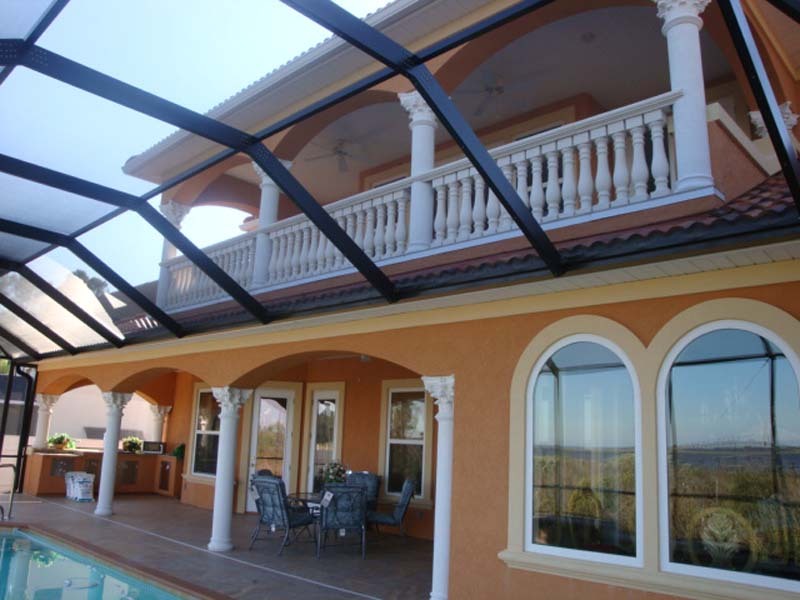 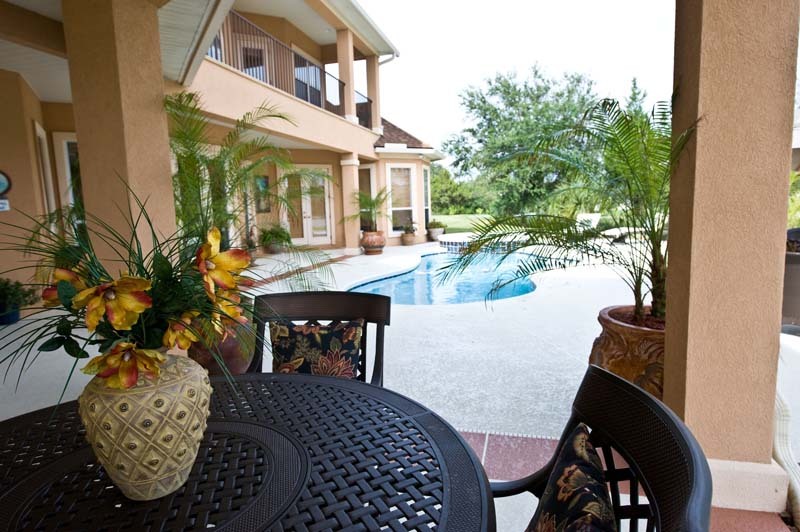 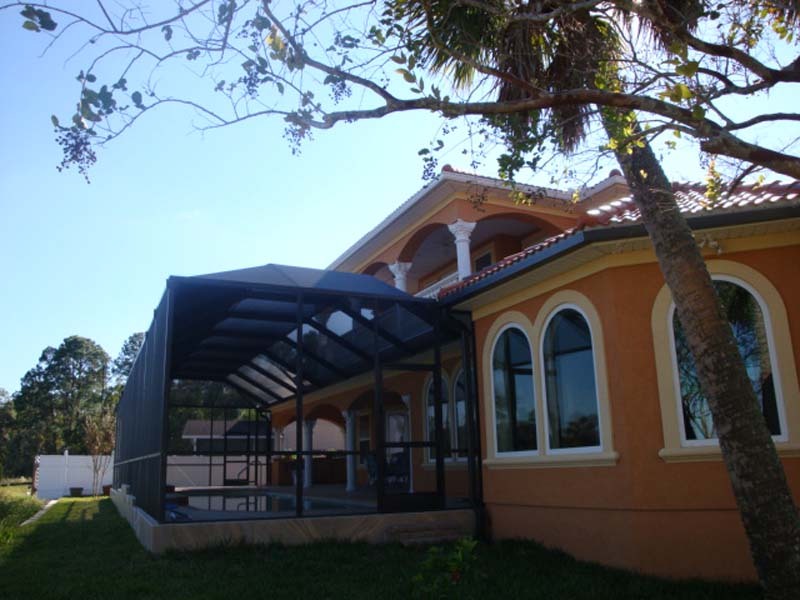 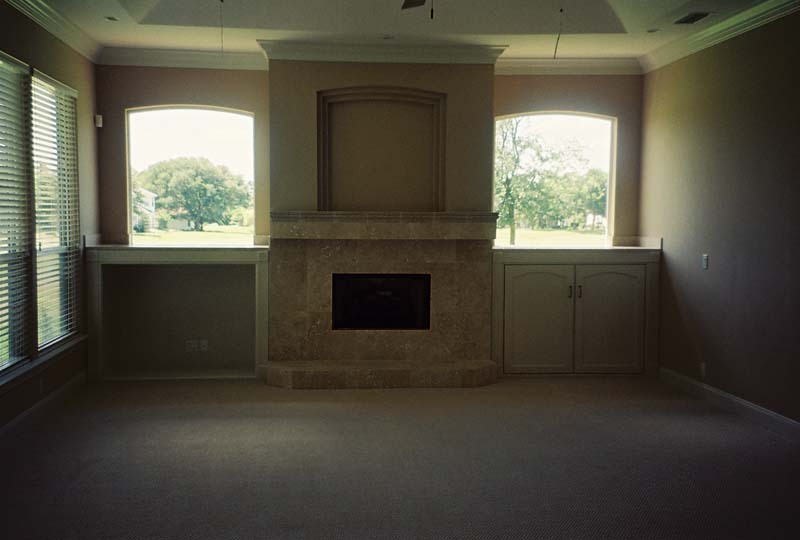 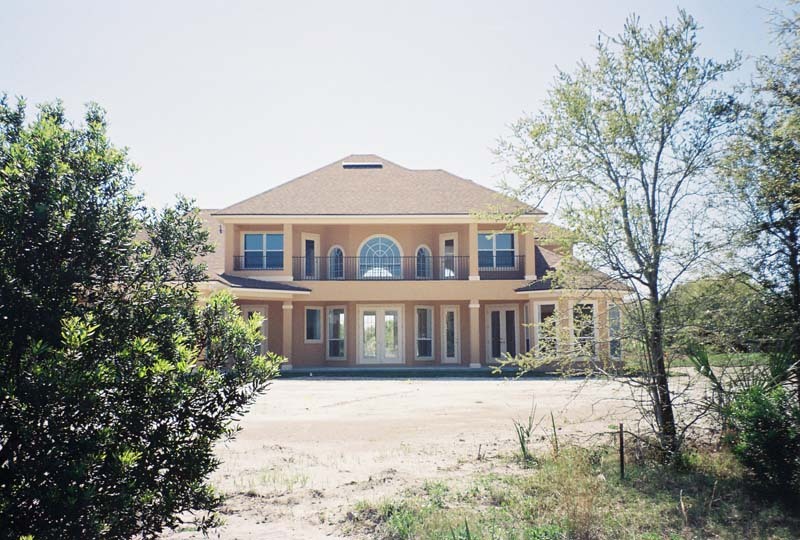 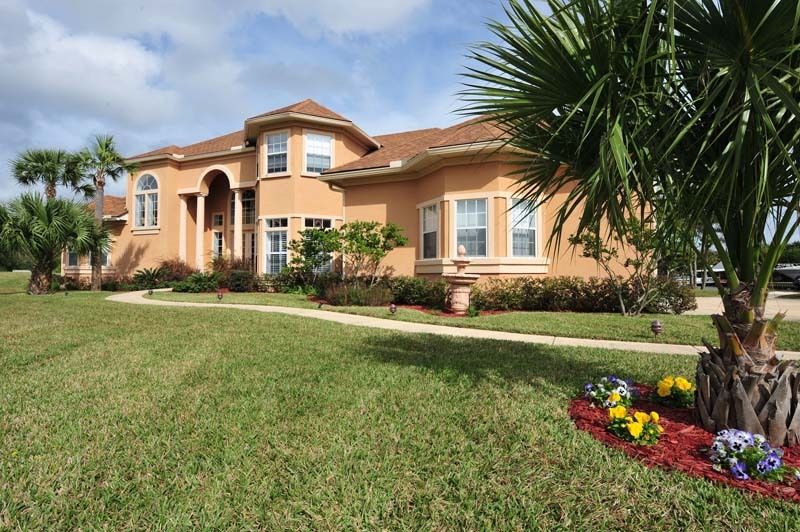 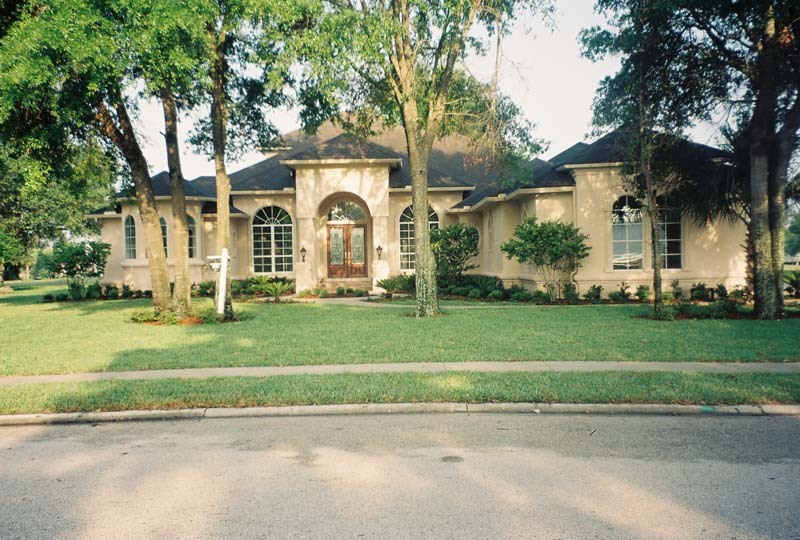 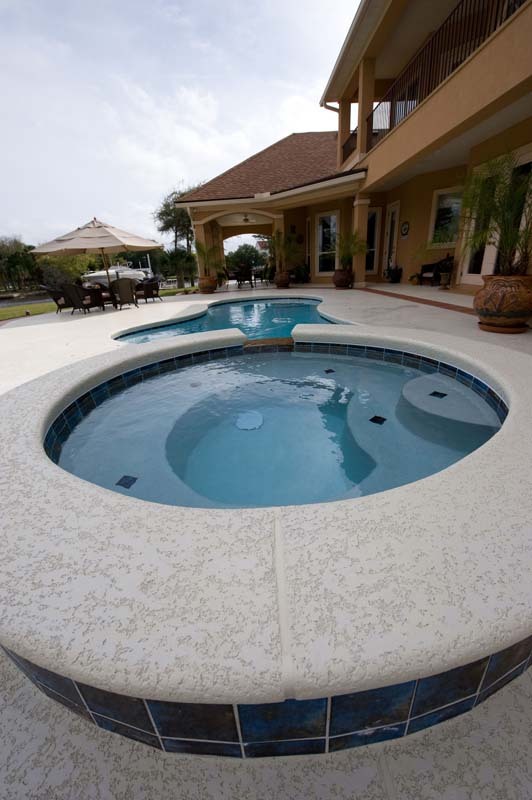 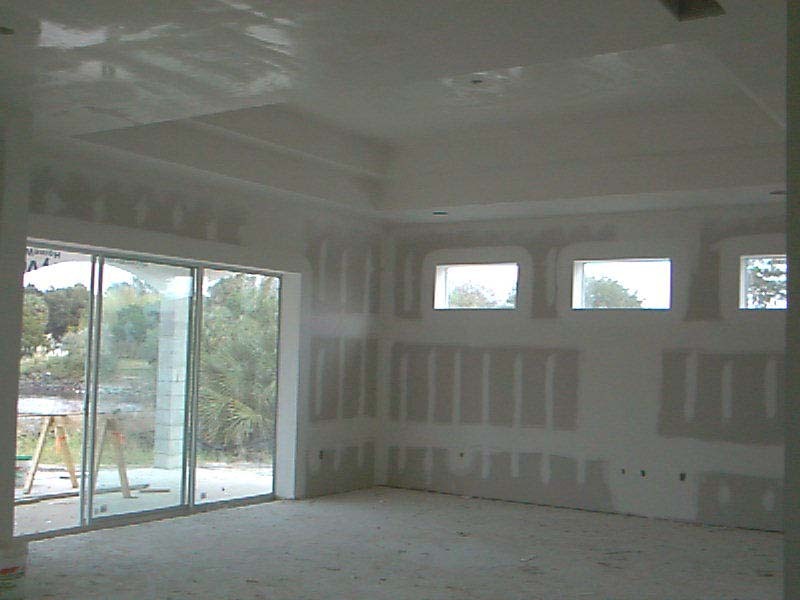 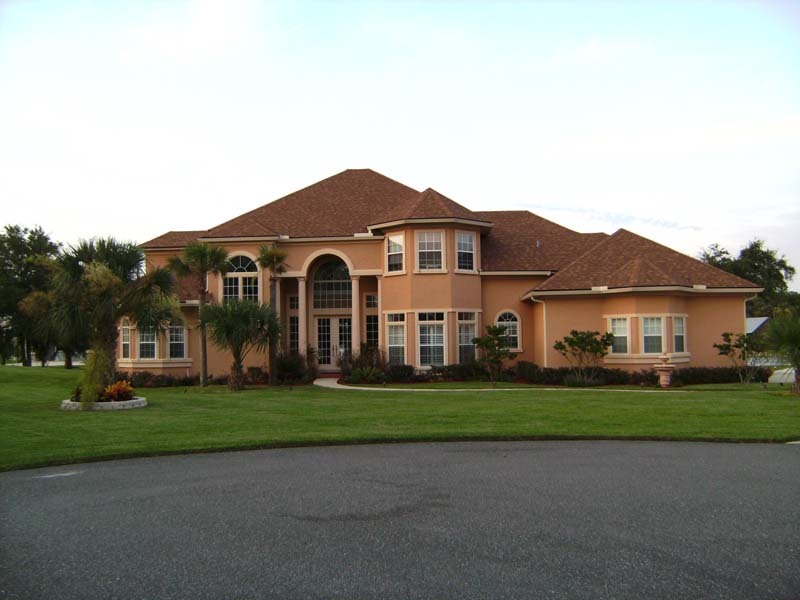 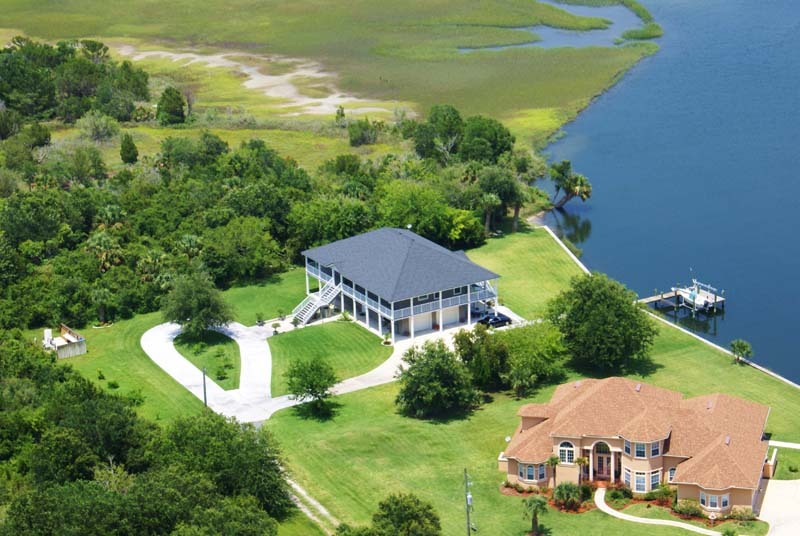 This stucco home has 4500 square feet with an attached game room overlooking the river. 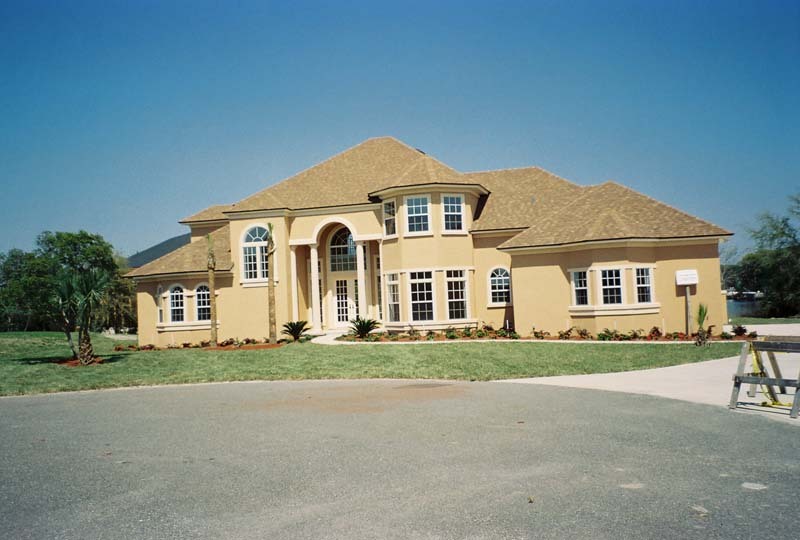 She chose Joseph Builders for their honesty and dedication in building a dream home. 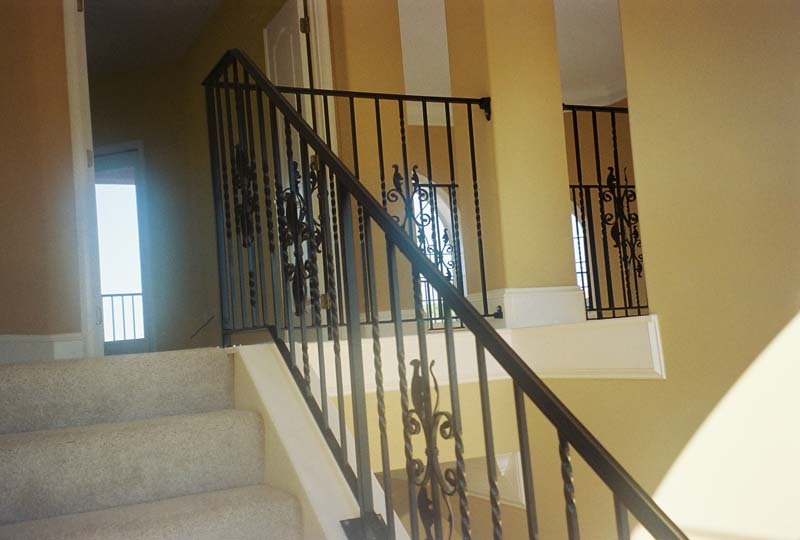 The upstairs deck with iron balustrades overlooks the river. 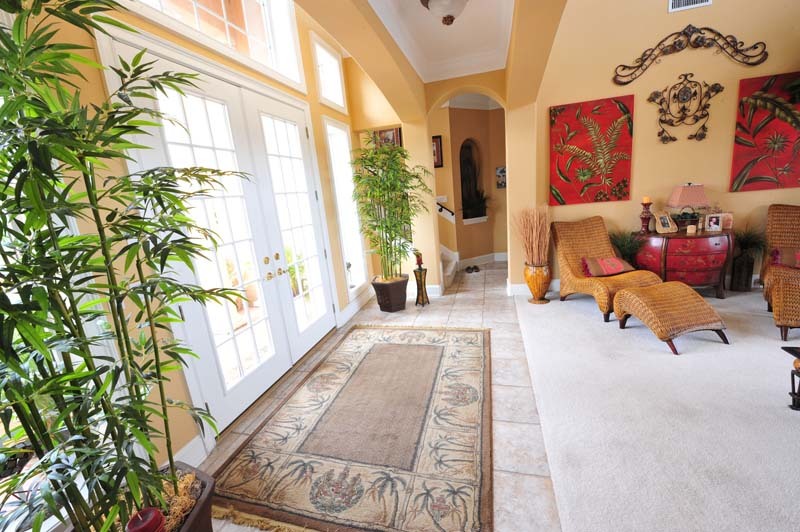 The soft, neutral, and earth tone colors work well with the Mediterranean style. 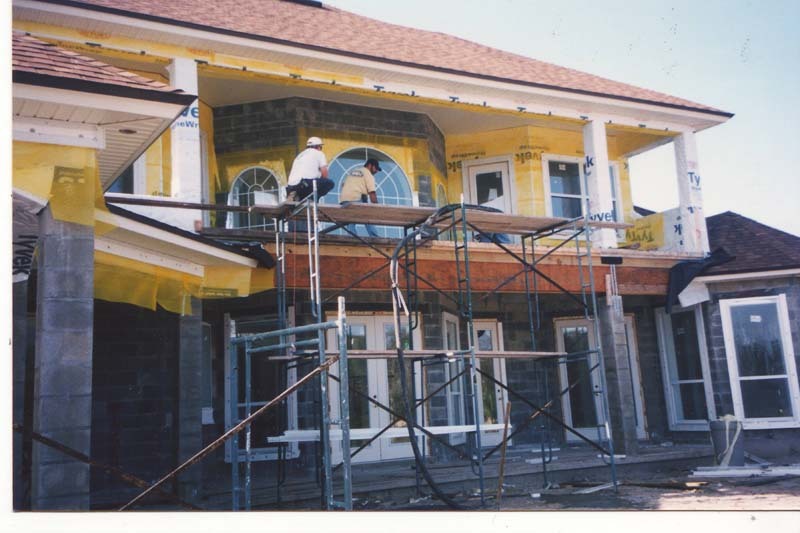 The front porch with the oversize window above is a perfect entrance into the two story front foyer showcasing the main stairwell the moment you step inside. 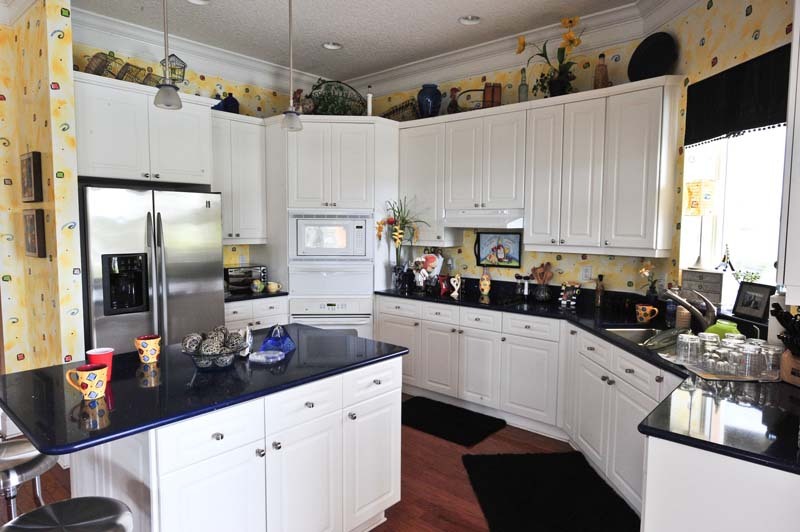 Throughout the house the attention to details in the custom crown is evident with Italian marble floors throughout and custom cabinets in the dream kitchen overlooking the river.